This report documents the Engineering an Energy-Efficient, Adaptable Hybrid Bicycle Motor System project from conception to completion. The report follows a structure that mimics the engineering process which guided the project, beginning with a general project description and goals for learning (Sections 1 and 2). The report documents the design process (Section 3), describes the process through which the hardware was purchased (Section 4), details how the physical structure of the motor system was built (Section 5), explains the electronics and circuitry of the bicycle (Section 6), and documents the software component of the project (Section 7). Finally, the report concludes with the testing, debugging, and results of the project (Section 8), a record of all of the support given towards completing this project (Section 9) and future intentions for the project (Section 10). Special thanks are due to Jeffrey Denenberg, Steven Buroff, the Trumbull Business Education Initiative, and Motors and Drives, for large donations of time and materials. The idea for Engineering an Energy-Efficient, Adaptable Hybrid Bicycle Motor System (EEEAHBMS) stems from the recent burst in popularity of hybrid cars that utilize the combination of a combustion engine and battery power for optimum efficiency. The goal of this project is to create a similar union between human power and electric power, turning a bike into an efficient and practical machine for long distance travel. 1. When peddling or traveling faster than the desired speed, the motor will act as a generator and send the extra energy provided by the rider into the battery for later use, slowing the bicycle down more efficiently than brakes (see section 1.2 Energy Efficient Regenerative Braking). 2. When traveling at less than the desired speed, the motor will provide the extra power required to achieve the desired speed. The result will be a machine that effectively combines the power of man and electricity and makes it practical to use the bicycle for longer distances. braking is the removal of the kinetic energy of motion from the bicycle. When hand brakes are utilized, brake pads clamp down on the wheel, slowing down its rotation. This means that the kinetic energy is being removed through friction. While this is effective, the energy lost due to friction will never be returned to the bicycle. It has been dissipated in the form of heat and sound. This project aims to overcome this inefficiency. Rather than braking through friction when the bicycle is traveling faster than the target speed, the regenerative braking system will take the extra kinetic energy and channel it back into a battery for future use by the motor. The aim of EEEAHBMS is not to simply transform one bicycle into a hybrid between human power and electric power. Its aim is to create an efficient motor system that is universal for almost every bicycle. This universality revolves around the mounting arrangement. With very few adjustments, the EEEAHBMS mounting arrangement will be compatible with almost every bicycle, making it relatively simple to transfer from bicycle to bicycle. This project does not include the bicycle itself; EEEAHBMS is an independent system that can be removed and added to an arbitrary bicycle without affecting its functionality. Safety is an important consideration for all newly designed systems. EEEAHBMS needs to be proven to be safe for use through many repetitive and deliberate tests, as well as incorporating many safety functions to address unexpected malfunctions during operation. · a routine that does not allow the motor to start until the bicycle is traveling at a minimum speed of 3mph. Engineering an Energy-Efficient, Adaptable Hybrid Bicycle Motor System is a research and development engineering project that is heavily focused on research. While it is the development phase that creates the final product, the research and subsequent knowledge gained is prerequisite for the development. As stated above, EEEAHBMS is an engineering project: an idea is being developed, designed, implemented and tested. Therefore, while there are many different components to this project, every single one of them is a branch of the engineering process. At the end, each of these different sections of the project represents research, learning and development along the way to the final product. Hence, the experience gained during the multi-step process will be relevant in real world engineering projects. the charging and discharging characteristics of batteries. With efficiency a large goal in this project, it is necessary that the relative energy efficiencies of different motors, batteries and controllers are understood before a selection and purchase of materials is made. The construction of the physical structure and mounting system of the motor system requires multiple custom-made metal components. Before a machinist can create these custom made parts, an accurate and to-scale drawing needs to be created. 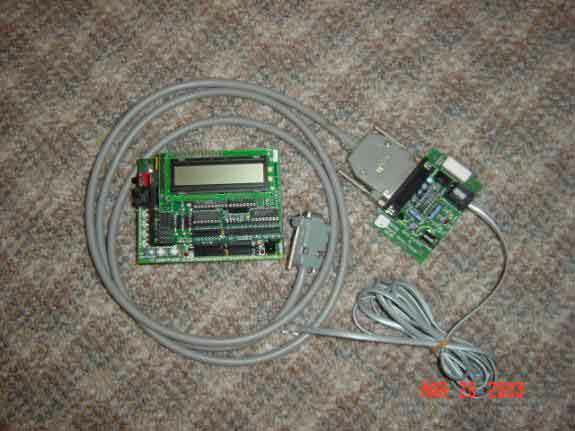 The Computer Aided Design (CAD) software CADKey ’97 R2 will be used. However, no CAD program is intuitive and self-explanatory. They all require some expertise in order to create a 3-D drawing that makes physical sense. In order to gain some fluency in the program, the included guided tutorials will be followed. However, this in itself is not sufficient. In addition, self instruction through experimentation will be the main method of learning exactly how CADKEY ‘97 R2 works. Software design is not a straightforward process. Approaching it with a rough outline and basic idea of what needs to be accomplished, much like an essay, is a mistake. Without an exact statement of how to implement the goals of the project, the software cannot be written. This is because each section of the software does not build on the last. Instead, the different portions of the program work together simultaneously. Therefore, just writing code from the beginning to the end like writing a book is not the correct approach. With the guidance of a professional programmer, the correct procedure for software design will be learned and then followed. This includes listing the purposes and functions of the project, and then creating a detailed Software Requirements document before even beginning to program. During this portion of the project, the structure of the procedure-oriented programming language, Interactive C, will be learned in preparation for the program implementation. One of the largest components of EEEAHBMS is its software. Since the 68HC11 “Handy Board” Computer will be used as the onboard computer to control the hardware, its programming language, Interactive C, will also be used. Interactive C is a subset of the C programming language, and mastery of its use will be absolutely necessary if the software portion of this project is to be completed. Learning a programming language is not a simple task. In order to become familiar with the syntax of this programming environment, some guidance will be necessary. However, beyond this, self-guided experimentation and the creation of test programs will provide the experience needed before diving into this large programming project. The EEEAHBMS programming in itself will be a learning process as mistakes will be continually discovered during the frequent testing and debugging. The electricity and magnetism portion of a Physics C course provided the foundation for the electrical knowledge needed to complete the circuitry component of EEEAHBMS. However, the project requires knowledge that goes beyond the scope of that course. Digital Logic and Boolean Algebra are necessary to understand the 7493 4-bit binary counters which will be implemented in the speed sensor circuit. An operational amplifier amplifies a voltage according to the ratio of resistors surrounding it and will be used to amplify the small signal from the current sensor. Also necessary for the current sensor is a voltage divider, which is essentially the exact opposite of an operational amplifier. It creates a point in the circuit where the voltage is reduced to a fraction of the original. covered. In EEEAHBMS, a capacitor will be used as a filter for a pulse-width modulated square wave. The purpose of this filter will be to make the average value of the current from the H-bridge readable. All of these topics will be discussed in more detail later in the report. The last, and often most difficult part of the engineering process, is testing and debugging. Unfortunately, one of the rules of engineering is that nothing works perfectly the first time. There is always some unexpected occurrence that needs to be solved after the fact. The goal of the testing portion of the process is to pinpoint the error; debugging is the process of repairing the mistake. In order to be a successful tester and debugger, a technique needs to be developed. It’s not always as straightforward as a problem and a solution. Often, innovation and clever manipulation of the resources at hand are necessary. There is a direct relationship between the complexity of a project and the amount of troubleshooting that needs to be done. Due to the complexity of EEEAHBMS, there is bound to be more than enough testing and debugging to be done. This experience will provide an accurate representation of working in the real world of engineering. The first few weeks of work on EEEAHBMS were spent researching the feasibility and functionality of different physical designs. Each possible design was evaluated for its strengths and weaknesses, and then a final design was chosen. While no construction was accomplished during this period, the necessary material list was created and a general design was finalized. Without a brainstorming period, no project can be successful. Motorizing a bicycle is not an original idea. While there have been no efforts to create a human power - electrical power hybrid as EEEAHBMS aims to accomplish, many different drive systems for motorized bicycles exist. Therefore, looking towards other system designs was a logical place to start. 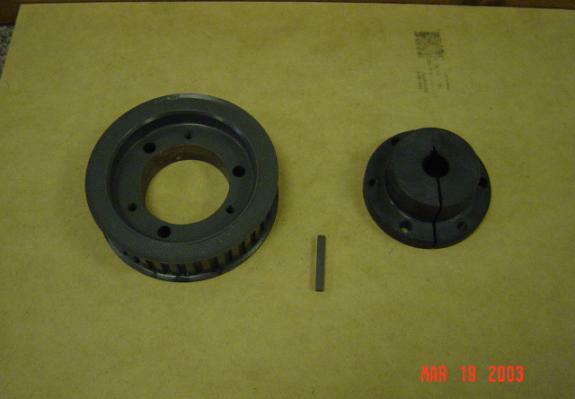 The simplest, cheapest and most widely used drive system is a friction drive. A friction drive consists of a motor turning a wheel which turns the wheel of a bicycle through friction. While it can be effective if correctly implemented, it does have a number of drawbacks. All of the drawbacks seem to revolve around “slippage”. Since the only method of connection between the motor’s drive wheel and the bicycle wheel is friction, the entire system is liable to slip. And, with slippage, there is a loss of energy and efficiency, as well as the potential for wearing down and ruining the wheel. In order to overcome slippage, the original wheel of a bicycle is often scrapped, especially if it is a mountain bicycle. Mountain bikes have especially bumpy treads, and this bumpiness limits the surface area between the drive wheel and the bicycle wheel. Therefore, a rough bicycle wheel, a compromise between a slippery smooth wheel and the mountain bike wheel, is ideal. However, there is yet another problem. If the wheel gets wet, there is an increased danger of slipping. While this is only a difficulty if it is raining, it needs to be taken into consideration. The tooth belt is the compromise between the friction belt and the chain. Motorcycles are the classic example of a “motorized bicycle” that use this model of a belt pulley. However, this design has its own drawbacks as well. This design does not lend itself well to the EEEAHBMS because it is not adaptable. The pulley stem that needs to be mounted to the wheel complicates the mounting arrangement and relies too heavily on the structure of the hub of the bicycle wheel. In addition, the belt pulley is dangerous. An exposed drive belt is a threat to the rider, because if a shoelace or a piece of clothing gets caught, it will be drawn into the motor. This makes it necessary to build a shield around the belt system, creating even more complications and making the system bulkier and heavier. 1. A hub motor is extremely expensive, and in order to get enough power to accomplish the goals of EEEAHBMS, the budget would be exhausted on the motor alone. 2. A hub motor is also extremely specialized, and the electronics required are beyond the scope of this project. The reasons for this will be discussed later. 3. Because the hub motor would be built into the hub of the bicycle, it makes adaptability difficult. 4. A hub motor does not do regenerative braking. Instead of acting like a generator when it needs to slow down, the hub motor free-wheels, or coasts to a stop. For these reasons, the hub drive design did not lend itself well to EEEAHBMS. The final drive system design is an original one devised while researching all of the different possible drive systems. Its design is a variation on the belt pulley drive. It has been named the belt friction drive. 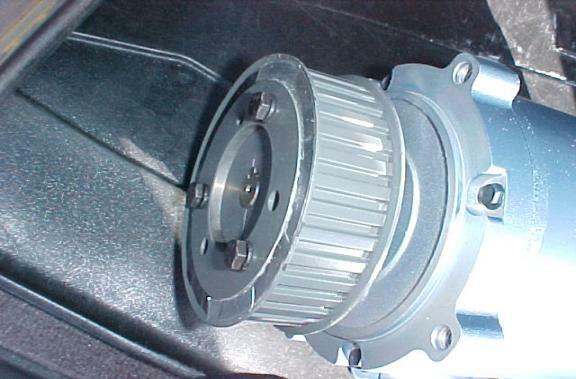 It consists of a motor driving a belt which is attached to a free wheeling pulley on the other side of the wheel. This belt is pressed down onto the wheel and it drives the wheel through friction. It has many advantages over the other drive systems. While the belt friction drive is similar to the friction drive system because it moves the wheel through friction, it does so over a much larger surface area than the friction drive wheel would. Therefore, slippage is much less of a problem. Belt friction drives are also portable from bike to bike because the belt friction drive does not involve mounting directly onto the wheel of the bicycle. After analyzing the different options for the drive system, the top choice was the original design of the belt friction drive. Beyond being one of the simplest, most effective, and containing the least drawbacks, it also added originality to the bicycle design that can be patented in the future. However, when choosing a design, the top choice is not always the right choice. When attempting to make a concrete drawing of what the design would look like, it became obvious that the belt friction drive was overly complicated for a first attempt. Since any overly complicated design is bound to fail, the friction drive was chosen. The drawbacks of the friction drive system are easily overcome, and it is by far the easiest to implement. In addition, the friction drive is the first step towards the belt friction drive. Once the friction drive is functioning, with the addition of a belt and a free wheeling pulley, it can be adapted into a belt friction drive. Therefore, the design choice was to build a friction drive system with the intentions of adapting it to a belt friction drive system in the future. 1. What type of motor will drive the bike? 2. What type of battery will supply the power to the motor? 3. What type of wheel will be used as a drive wheel? To decide on a type of motor, battery and drive wheel, the same process of enumerating all of the different possibilities and then listing their strengths and weaknesses was followed. The first class of motors was the very low cost motor. Every motor has a field and coils that move with respect to each other. In general, the coils rotate on an armature through the field, using brushes to continually flip the current in the coils. The flipping of currents allows the coils to have the correct magnetic polarity to be attracted and repelled by the field at the appropriate times, keeping the motor running rotating. There are exceptions to that rule however. In some motors, it is the field that rotates and the coils that remain stationary. In these low cost motors, the field is created by a separate field winding. 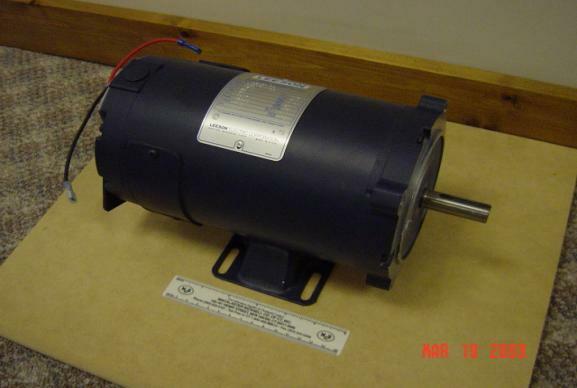 While this creates a very light motor, the very low cost motors are not terribly efficient. Much energy is wasted in the current that flows through the field windings. While controlling the field current provides a very easy way to control the speed of the motor, it also poses a problem. The current in the motor and the speed of the motor are an inverse relationship. The lower the current, the faster the motor rotates and vice versa. However, if the current in the field windings reaches zero, or even approaches zero, the motor will spin too quickly and destroy itself. Another class of motors is the brushless motor. An example of a brushless motor is a hub motor. They are extremely efficient, very powerful, and lightweight. However, they require very complicated electronics because, instead of a brush, electronics inside of the motor flip the currents of the field windings and the rotating coils to keep the motor turning. While this is an extremely effective approach, it would be necessary to purchase all of the motor control electronics which would shortchange the learning goal of EEEAHBMS. Therefore, the brushless motors were not chosen. This graph shows that the rotations per minute at the equilibrium speed (speed that the motor accelerates to and then stabilizes) of a permanent magnet motor is independent of the load placed on the motor. This was intriguing, and, after further research, the fact that a permanent magnet motor has a steady state speed was discovered (see 3.2 Control System for more details). Based on this information, the motor class choice for EEEAHBMS was the permanent magnet motor. Before the different classes of batteries could be examined, a few calculations were required. By examining other motorized bicycle designs, it was determined that to accomplish the goals of EEEAHBMS, a half-horsepower motor was needed. Taking into account some inefficiency, a half-horsepower is equal to about 400 Watts, which is a measure of power. And Power is equal to Voltage X Current. From some quick research on different gauge wire and the relative currents they could handle, a 24 Volt battery (a convenient multiple of the standard 12 Volt car battery) was chosen because that left the current that needed to be handled at 20 Amps. And, a reasonable 10 or 12 gauge wire can easily handle 20 Amps. Finally, the rating in amp-hours of the battery was going to be determined by cost and weight, with a target amp-hour rating of about 12. An amp-hour is a measure of how much current a battery can supply before draining itself. (One amp supplied for one hour is an amp-hour. And, 100 amps supplied for 1/100 of an hour is also an amp-hour.) From research on the success of other motorized bicycles, it seems that 12 amp-hours would give the bicycle a range of 10 miles. Obviously, a higher rating in amp-hours is desirable, but as the rating of a battery rises, so do its cost and its weight. The first class of rechargeable batteries that was examined included nickel cadmium batteries and nickel metal hydride batteries. Both of these types are deep discharge and can be charged many times before losing effectiveness. In addition they have one of the best energy storage to weight and volume ratios. They are such good batteries that they are even used in hybrid cars. However, nickel cadmium and nickel metal hydride batteries have some serious flaws. Nickel cadmium batteries have “memory.” These batteries, if not fully discharged before charging, “remember” the degree to which they were last discharged. Then, during the next power cycles, this memory will prevent the battery from ever discharging below the point to which it was discharged last, despite the fact that the battery is capable of being further discharged. Since EEEAHBMS will not always fully discharge a battery before charging it back up, this characteristic is highly undesirable. While the nickel metal hydride batteries do not have the same memory characteristic, both the nickel cadmium and nickel metal hydride batteries are extremely expensive. For example, a 6 Volt nickel metal hydride cell, rated at 1.2 amp-hours costs $20. If you connect 4 of these batteries in series, the desired 24 Volt rating is achieved. And if you connect 10 of these 4 battery strings in parallel, a reasonable rating of 12 amp hours is achieved. Therefore, 40 batteries are required to produce 12 amp-hours at 24 Volts. This would cost $800, which is far above the budget for this project. The second class of batteries is the wet-cell lead acid battery. These are the batteries that are typically used in cars. While these batteries store a lot of energy and are incredibly reliable, they do not like a deep discharge. For example, on the fourth or fifth time a car battery is drained completely from the headlights being left on, it needs to be replaced. Another drawback of the wet-cell lead acid batteries is that they need to be maintained vertical at all times. If tipped, these batteries are dangerous because of the acid they contain. While a vertical orientation can be insured inside a car under normal circumstances, a bicycle is much more likely to be accidentally tipped. The third class of battery is the sealed lead acid battery. This battery is very similar to a wet-cell lead acid battery; however its acid is captured in a gel or in a sponge-like membrane. Therefore, tipping is no longer an issue. In addition, the sealed lead acid batteries can be discharged and charged over 500 times without any harm to the battery, as long as a special battery charger is used and care is taken not to overcharge or discharge the battery. And, finally, these batteries are not expensive. Two 12 V batteries, both rated at 12 amp-hours cost less than $90, one tenth of what a nickel metal hydride battery would cost. Based on this analysis, the battery choice for EEEAHBMS was the sealed lead acid battery. The drive wheel is the wheel that the motor drives, which in turn drives the bicycle wheel. This decision was fairly easy, as there were only two possibilities with one having clear advantages. The first possibility was a grinding wheel. While this would provide a lot of friction to the wheel, it had a serious flaw. If the grinding wheel were to slip for any reason, it would do what it is made to do: grind. And before long, the wheel would be destroyed. The other drive wheel possibility was a sheave (pronounced “shĩv”). A sheave is very similar to a pulley, with the only difference being that a pulley is free wheeling and a sheave locks on to a shaft. While a sheave does not have as much friction as a grinding wheel, it is much more suited for EEEAHBMS’s purposes. It is not as large of a threat to grinding the wheel down, it has features which make it easy to connect to the motor, and it is compatible with the intentions to test a belt friction drive in the future. Based on this analysis, the drive wheel class choice for EEEAHBMS was the sheave. Once all of the components of the drive system were selected, all of the other components quickly fell into place. Based on the selection of a permanent magnet motor, the control system needed to be able to produce a variable voltage in order to control the speed of the motor. As previously explained, there is a linear relationship between the voltage placed across the motor, and the speed of the motor. And, this is independent from the load placed on the motor. This is true because as the motor speeds up, it produces a back EMF. This back EMF is basically an anti-voltage, which is linearly related to the speed of the motor. When the back EMF equals the variable voltage supplied by the controller, the motor stops accelerating. For a permanent magnet motor, the standard variable voltage supply is an H-bridge. An H-bridge is comprised of two sets of two switches, making the shape of an H. These sets of switches, when turned on and off, alternately switch the battery positively and negatively across the motor. These switches flip back and forth approximately 1000 times per second, and set up an average voltage across the motor. The average voltage depends on the duty cycle, which is determined by an inputted voltage (from the Handy Board computer). For example, if the switches connect the battery across the motor equally positively and negatively, then the average voltage will be 0 as they will cancel. However, if the duty cycle connects the battery across the motor for 75% of the time positively, and 25% of the time negatively, then the average voltage is 50% of the positive nominal voltage, which in the case of EEEAHBMS, is 12 volts. The design of the regenerative braking system for EEEAHBMS is very simple; it only required choosing an H-bridge that did regenerative braking. The decision on whether to make the H-bridge or to buy it was an easy one. An H-bridge is a complicated piece of equipment, and to build it from scratch would be unpractical when they are reasonably priced. H-bridges rated at 20 amps continuous duty are priced from $100-$150, depending on features. A bidirectional H-bridge is capable of running a motor forwards and backwards. While this adds minimally to the cost of the H-bridge, it was undesirable for EEEAHBMS. A bicycle is not meant to run backwards, and if a bidirectional H-bridge was used, the bicycle could start moving backwards accidentally and potentially hurt the rider or the bicycle. For example, if the H-bridge’s duty cycle connected the battery across the motor positively only 25% of the time, the motor would run backwards at half speed. This is the opposite scenario from when the battery was connected across the battery 75% of the time. Another feature that an H-bridge can have is dynamic braking. Dynamic braking is the capability for the H-bridge to short out the motor and shunt all of the current to ground. This causes the motor to stop immediately. Dynamic braking adds to the price of an H-bridge because it takes extra transistors for the H-bridge to be able to handle the current involved in shorting out the motor. The dynamic braking feature wasn’t required for the EEEAHBMS because it stops the motor too quickly. Dynamic braking would cause damage to the wheel and loss of control of the bicycle. However, having an H-bridge that did include dynamic braking was not as undesirable as a bidirectional H-bridge. This is because it is difficult to accidentally enable the dynamic braking feature. It requires an extra connection and extra wiring that can easily be omitted. Regenerative braking is the H-bridge feature that is most pertinent to this section of the design. The regenerative braking function requires that the H-bridge can handle the flow of current in both directions: from the battery to the motor and from the motor to the battery. And, because transistors usually only like to conduct current in one direction, the addition of transistors for the regenerative braking function does increase the H-bridge’s price. 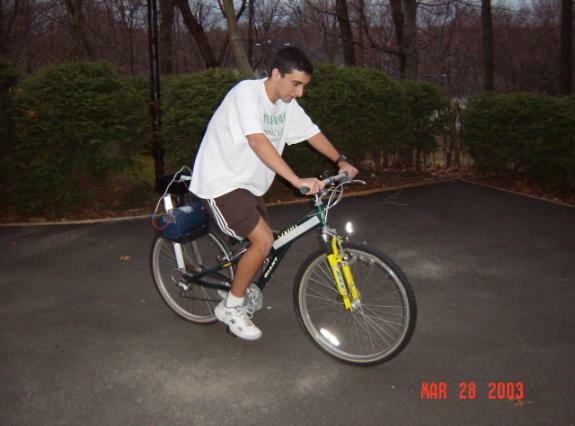 Once the basic design of EEEAHBMS was created, the next step was to figure out how to mount it on a bicycle. 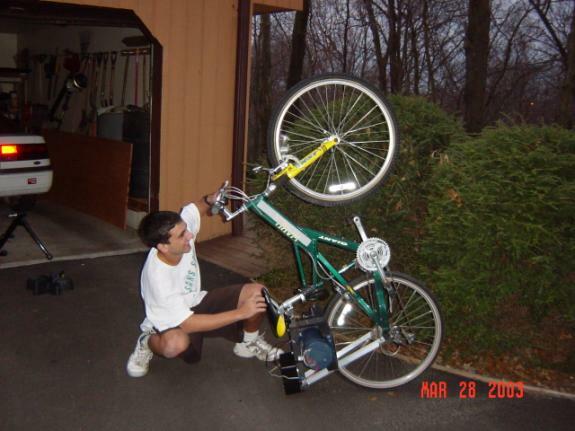 However, this wasn’t as simple as figuring out how to mount EEEAHBMS on the bicycle in the garage. In order to achieve the adaptability goal of the project, the mounting arrangement needs to be simple and compatible with all bicycle frames. After an informative trip to Cycle Fitness in Monroe, and a long discussion with the manager of the bicycle shop, a basic mounting arrangement was designed. There are two aspects of a bike that are universal: the bicycle seat and the rear axel. Therefore, these two locations are the logical place to mount the motor. In fact, these are also the two easiest places for mounting. The seat post of the bicycle seat provides an easy, sturdy place for clamping, and the rear axel has threaded mounting holes. Every bicycle has these standard threaded holes for mounting rear fenders or carriers for babies and school books. While this mounting arrangement is simple and compatible to most bicycle frames, there are a few exceptions. The first exception is the racing bike. Racing bicycles have very thin frames, designed to be light and aerodynamic. They cannot safely support the addition of a 60 pound motor system. Therefore, EEEAHBMS will not be compatible with racing bicycles. However, this is not a terrible loss, as it is difficult to imagine a bicycle racer wishing for electric assistance. The other exception is any bicycle that has a set of shock absorbers on the rear wheel. Rear shocks cause the rear axel to move relative to the bicycle seat. And, this is not compatible with a mounting arrangement that clamps onto these two parts of the bicycle. One last mounting detail needed to be addressed. Since a friction drive is going to be used, the bicycle cannot have a mountain bike tire. Mountain bike tires are very bumpy and have a lot of knobby irregularities which are meant to increase traction and stability off-road. However, these bumps would prevent the drive wheel from having contact with a consistently smooth and regular wheel surface. Therefore, for mountain bikes, the rear tire would have to be replaced in order to be compatible with a friction drive. Once the mounting arrangement was decided, the manner by which the weight of the motor and battery of EEEAHBMS were to be distributed needed to be determined. 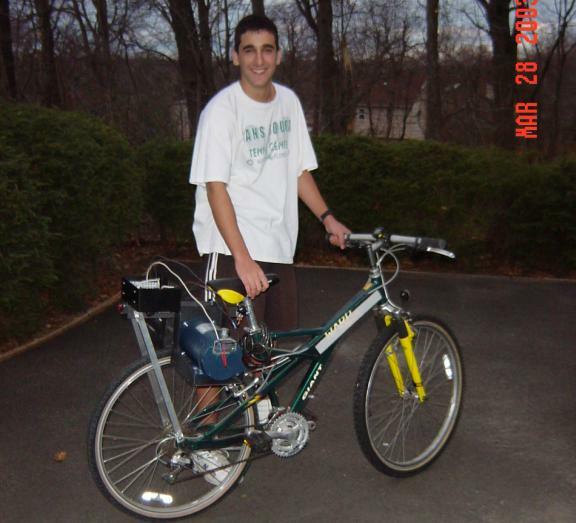 Maintaining a balance on the bicycle wasn’t going to be easy with a 23 pound motor and two 9 pound batteries. However, there is a logical solution. The two 9 pound batteries can balance the 23 pound motor if they are placed on the opposite side of the bicycle. So, a “saddle-bag” design for mounting was adopted. A metal channel is mounted to the seat post of the bicycle and supported by an angle-iron mounted to the rear axel. Across this channel are saddlebags with a compartment on each side of the bicycle: one side for the motor and the other side for the two batteries. With this general design decided, the feasibility of the weight distribution of the motor and batteries was proven. The final system to be defined was the safety system. Safety is always of foremost importance in design. When researching other motorized bicycles, a common safety precaution emerged: the motor would not start unless the bicycle was already going 2-3 miles per hour. This is to prevent the bicycle from running off on its own, without the rider on it, or before the rider is in control of the bicycle. It’s a logical precaution and was incorporated into the design of EEEAHBMS. Another safety measure that was incorporated was a computer shut down if the current spikes above a specified “high water mark.” The electronics of the bicycle isn’t rated to handle currents above 20 amps continuously, and, therefore, it needs to be protected from damage caused by the motor pulling too high of a current. With the computer monitoring the current, it is a simple safety measure to have the software shut everything down if the current spikes above the high water mark. In designing a safety system, redundancy is the key. Therefore, in addition to the software shutdown if the current exceeds the high water mark, there will be a hardware shutdown as well. This will be accomplished with a simple fuse. If the current gets too high, the fuse will blow; the metal inside the fuse will melt, breaking a circuit. Another aspect of the safety system concerned braking. Regenerative braking is not appropriate for sudden, emergency stops. Dynamic braking was first considered for this purpose. It seemed to be the easiest way to ensure a rapid stop. However, during testing, this was proven to be highly unsafe because it stopped the motor too quickly. A sudden stop could damage the motor and the wheel, as well as causing the rider to lose control. Therefore, a more elegant and less brute force solution to the requirement for a sudden stop was designed. The handbrake serves as an emergency switch. Pumping it causes the computer to reset the bicycle’s desired speed to zero, which slows the bicycle down quickly. And, with the bicycle’s desired speed at zero, the handbrakes can then be used in tandem as they would normally be used, achieving a quick and safe stop. As another safety precaution, there is be a main software shutdown switch as well as a hardware shutdown switch. And, finally, there is a main on-off switch. Once again, redundancy is the key. However, the main on-off switch cannot be flipped while the motor is in use because it is not rated at high currents. Once the overall general design for EEEAHBMS was completed, the next step was to purchase all of the major components of the project. For details on the prices of each component, see Appendix A Costs of EEEAHBMS. 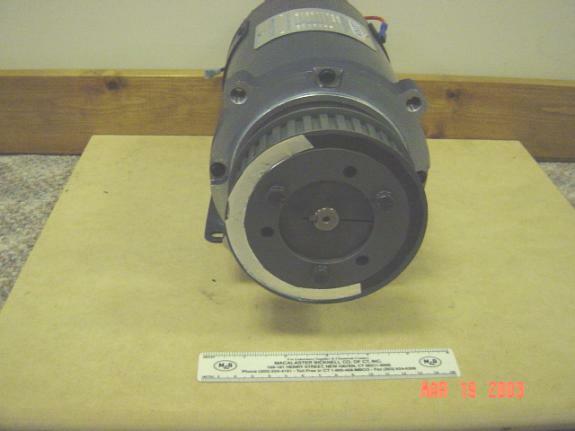 Based on the EEEAHBMS design, the motor requirement was a ½ horsepower permanent magnet motor, rated at 24 V and 20 amps continuous duty. So, the motor search began. After shopping around on multiple websites, it was determined that motors are extremely expensive. While surplus motors are available on e-bay for between $150-$200, it was impossible to find a motor with the correct specifications. This left a price range of $300-$400, which was unacceptable for the EEEAHBMS budget. After contacting Motors and Drives, a family owned company, the motor search began to look more promising. Casey O’Donnell, an engineering student at Fairfield University and member of the Motors and Drives team helped to find the best motor suited for EEEAHBMS. And, after pinpointing the desired motor, Casey donated it. The motor chosen is a Leeson #108051: ½ horsepower, 1800 rpm permanent magnet motor rated at 24V and 20 amps continuous rating. This motor was perfect for EEEAHBMS. And, if it hadn’t been donated, the motor would have cost $365.00 plus shipping. The Leeson motor weighs 23 lbs. and has a 5/8 inch shaft with a hardened metal key. It is approximately 5 ½ inches in diameter, 9 ½ inches long and has a 2 inch long shaft. The Leeson motor has four mounting holes on the face of the motor as well as a base that is equipped for mounting. Later along in the project an even better British LEM 130 motor was found for EEEAHBMS. However, while its specifications are better, making it more powerful, much lighter and less bulky, it is more than twice as expensive as the Leeson 1800, and it would have not been donated. The EEEAHBMS design requires a 24 V sealed lead acid battery, rated at 12 amp-hours. After shopping around, it was determined that there was no way to get batteries inexpensively. And, it was apparent that the easiest way to achieve the voltage desired was to use two12 V batteries in series. The most inexpensive batteries at the desired ratings to be found were at www.Electricscooting.com. So, the two 12 Volt, 12 amp-hour batteries were ordered for $95.90. 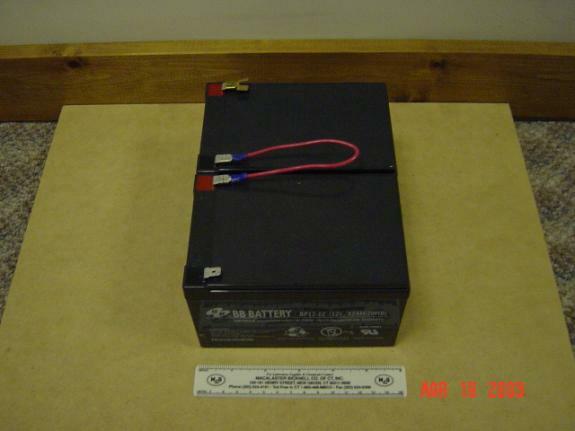 These sealed lead acid batteries weigh 9 lbs each, and are 5 15/16 inches long, 3 3/4 inches tall and 3 7/8 inches wide. These batteries need a special charger because (see 4.8 Battery Charger) they do not survive overcharging, and they must be charged at a higher voltage than normal wet-cell lead acid batteries. When fully charged with the correct charger, the batteries are actually at 26 V.
The length of the life of these sealed lead acid batteries is mainly dependent on how far they are discharged each time. The battery needs to reserve the bottom 20% of its charge to prolong its life. Without this reserve, a completely drained battery would give only 100 recharges. By using 80% of the battery capacity the number of recharges increases to 400-500 cycles. If half of the available charge is used during each cycle, the battery can survive 700-800 cycles. Therefore, it is beneficial to avoid fully discharging the battery (information found at www.currietech.com.au/products/uspd.htm#top). The sheave (pronounced “shĩv”), identified in the EEEAHBMS design, is going to function as the drive wheel for the system. However, before shopping around for a sheave could begin, it was necessary to know the approximate target size for the sheave. This would determine the bicycle’s top speed. According to Connecticut state law, (found at ct.gov) a moped (motor-assisted bicycle) cannot have a top speed of over 30 mph. A moped with a top speed over 30 mph is considered a motorcycle, which requires a special license. Therefore, the top speed could not exceed 30 mph. To be safe, a top speed of 25 mph was selected. 1800 rpm * 60 minutes per hour = 108,000 rotations per hour. 25 miles per hour * 5280 ft per mile * 12 inches per foot = 1,584,000 inches per hour. 1,584,000 inches per hour / 108,000 rotations per hour = 14.67 inches per rotation. Since the circumference of the shiv = 14.67 inches = pD, the diameter of the sheave = 4.6 inches. Once again, Casey O’Donnell of Motors and Drives came to the rescue. He found two industrial timing belt sheaves which would be perfect for EEEAHBMS’s purposes. One was a little less than 4 inches in diameter and the other was 4.3 inches in diameter. The 4.3 inch sheave was selected, as it would give the bicycle a maximum speed of 23 mph. Once again, Casey was more than generous, donating the sheave as well as the SDSX58 bushing that would adapt it to the 5/8 inch keyed shaft of the Leeson motor. On the left in Figure 4c is the industrial timing belt sheave, with the bushing on the right and the hardened metal key in the middle. The bushing and the hub are connected by 3 hexagonal-head screws that pull the bushing into a slightly tapered hole in the sheave. The taper creates a reliably balanced and secure connection between the bushing and the sheave. In fact, the tapered hole creates such a secure connection that it is nearly impossible to remove the bushing from the sheave once it is in place. In order to remove the bushing, you first remove the screws and then use those screws in three different holes. These holes are designed to do the opposite of the first three: they are meant to help the user push the bushing out of the sheave. With the extra force of the screw action combined with the lever arm of a ratchet wrench, it is possible to remove the bushing from the sheave. The sheave and the bushing are made of hardened spring steel, making them very difficult to damage. And, because the sheave is a timing belt sheave, it has grooves for the belt it is meant to drive, making it perfect for the EEEAHBMS application. The grooves will provide nice friction between it and the bicycle wheel that it is driving. The bushing and sheave mount onto the motor as follows: The hardened metal key is placed into the groove on the shaft of the motor and then the bushing slides over the key and the shaft. The key serves the purpose of creating an irregular, non circular shape for the bushing to connect with, so that the bushing cannot turn. Then a recess-hexagonal drive set screw is tightened down onto the metal key using an Allen wrench, securing the bushing onto the motor. Then, the sheave is connected to the bushing as previously described. The metal channel, as described in the design portion of the project, serves as the “backbone” of the structure of EEEAHBMS. It is mounted to the pole supporting the bicycle seat and to the rear axel of the bicycle. And every other piece of the structure is mounted to it. Therefore, strength is an absolute requirement. For about $10, two feet of standard industrial 3 inch channel was purchased from Magna Steel in Bridgeport, CT. This industrial channel is made of soft steel, which makes it easy to drill holes for mounting. And, even though it is very heavy, it is also very strong. The last 7 inches of the channel were removed later in the project as they were unnecessary and their removal would save weight. Details about this removal and the T-hinge mounted on the end of the channel in Figure 4e can be found in section 5 Construction. The EEEAHBMS design requires an H-bridge controller rated at 24V, 20 amps continuous duty. And, as described earlier, a desirable H-bridge would lack bidirectional control and have regenerative braking; dynamic braking was optional. After a web search of H-bridge suppliers, it was apparent that a commercial unit would cost between $200-$250. After some more searching, an off-brand supplier who sold decent H-bridges for $150 was located. However, this was still above the EEEAHBMS budget. So, the search began for surplus H-bridges. It turns out that an electric bicycle company that produced the EV Warrior bicycle went bankrupt recently. And, they had thousands of specialty Curtis 1505 commercial unit H-Bridge Controllers in stock when they went bankrupt. So, there are surplus Curtis 1505s on sale for $45 - $60. This was a steal. Curtis controllers are very high quality and would otherwise be priced at or over $150. The Curtis 1505 comes with its own mounting case and is unidirectional with regenerative and dynamic braking. The dynamic braking has two triggers. One trigger will enable dynamic braking if it is ever disconnected from the positive terminal of the battery, and the other trigger will enable dynamic braking if it is ever connected to the negative terminal of the battery. This was determined through trial and error experimentation, as limited documentation was available. The Curtis 1505 also has a built in protection against discharging the batteries completely. If the batteries ever drop below 18 V, then the controller will shut down the system automatically. Such a low voltage is a warning sign that the batteries are nearing complete discharge. Finally, the Curtis 1505 has thermal protection. This consists of a heat sensor that will shut down the controller if it exceeds a certain temperature. This is to prevent the controller from overheating due to high currents. 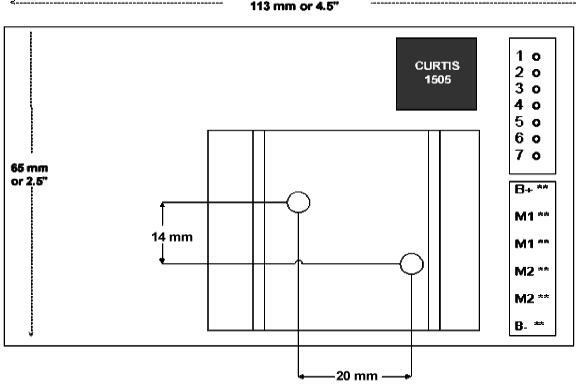 Figure 4g is a wiring diagram of the Curtis 1505, and Figure 4h provides the physical dimensions of the Curtis controller. While Figure 4g also shows that the H-bridge has a built in current sensor, during initial testing, there was no evidence that the current sensor’s reading was accurate. So, it was not used and a different current sensor was devised (see section 6.2 Current Sensor Circuit for more detail). The control for the Curtis 1505 is intended to be a 5k potentiometer (see section 4.6 Potentiometer for more details). The 5k potentiometer outputs anywhere from 0V to 4V. If the output is zero volts, the controller outputs 0V to the motor. If the output is 4V, the controller outputs 24V. The relationship between the output of the potentiometer and the output of the controller is linear. And since the relationship between the output of the controller and the speed of the motor is linear, the relationship between the output of the potentiometer and the speed of the motor is linear as well. If any one of the three leads of the potentiometer disconnects, the controller automatically switches to dynamic braking. A potentiometer is basically a voltage divider. It has three wires connected to a resistor. The first wire is power, connected to one side of the resistor and having a certain given voltage. In the case of the 5k potentiometer, the resistor has a resistance of 5,000 ohms, and the power side of the resistor has a voltage of 4V. The second wire is connected to the other side of the resistor and is ground (0V). Therefore, the resistor has a voltage drop of 4V. 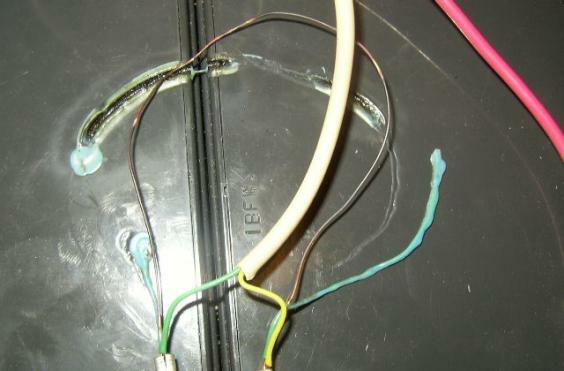 The third wire is a wiper, connecting to anywhere between the other two wires, depending on where the knob of the potentiometer is turned. If it is turned all the way towards ground, then the third wire is at ground and carries a voltage of 0V. If it is turned all the way towards power, then it carries the full voltage. And, if the third wire is connected between the power wire and the ground wire, the third wire carries a fraction of the total voltage. 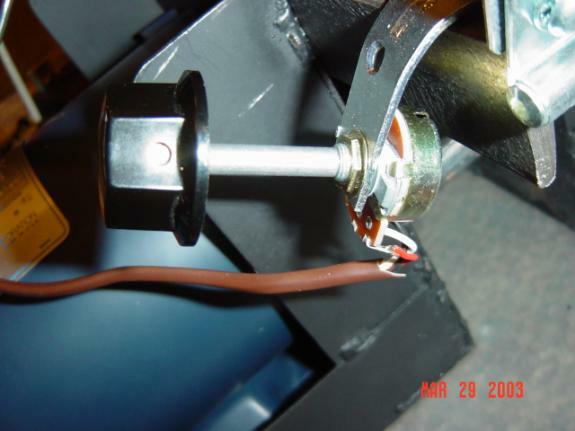 There are two main types of potentiometers: linear taper and logarithmatic taper. The names reflect the relationship between where the third wire is attached and what fraction of the voltage is carried by the third wire. In a linear taper, the relationship is linear. If the third wire is attached half way between, then it carries half of the total voltage. If it is logarithmatic taper, then the ratio is logarithmatic. For the purposes of EEEAHBMS, linear taper is ideal. Logarithmatic would be more complicated than necessary, and is more suited for uses such as audio intensity which are exponential in nature. Therefore, the potentiometer used for EEEAHBMS is a 5k linear taper potentiometer. Its output is anywhere between 0V and 4V, and, as previously mentioned, the output is linearly related to the speed of the motor. The fact that the power wire of the potentiometer carries only 4V is very convenient. After the bicycle is working, the intention is to have the HandyBoard Computer control the speed of the bicycle, so that the HandyBoard can better protect against current surges. And, since the HandyBoard is capable of outputting up to 9V, having the HandyBoard mimic the potentiometer is trivial. This 5k linear taper potentiometer was purchased at Radio Shack for approximately $5. Potentiometers are not expensive. The knob on the end of the potentiometer was also purchased from Radio Shack for approximately $2 and attached to the end of the potentiometer to make the turning of the potentiometer easier. The HandyBoard is a programmable robotics controller that was designed and built for MIT robotics students. Its programming language is Interactive C, an interpretive subset of ANSI C. Interpretive means that instead of compiling all of the commands into code prior to program execution, the program processes the commands as they come. While this makes Interactive C a little slower than ANSI C, it also makes it much easier to test and debug. But, since Interactive C is only a subset of ANSI C, some functions aren’t available. Even though Interactive C is somewhat limited and not truly a professional programming environment, it is perfectly capable of handling the software requirements of EEEAHBMS. The HandyBoard and Interactive C provide a “persistent variable” feature. A value stored in a persistent variable will retain its value when the HandyBoard is reset, power cycled, or when the program initializer, main(), exits and is subsequently restarted. A persistent variable will be reset to the initial value when the program is downloaded into the HB. This function will allow the HandyBoard to keep track of information that spans multiple trips, such as distance traveled and energy flow. The HandyBoard has both analog and digital inputs. An analog input is a voltage while a digital input is an 8-bit binary number. The digital number is unsigned, assumed to be positive, and between 0-255. The HandyBoard also has an A-D converter. It has the capability of reading a voltage, converting it into a digital number, and outputting this digital number. The HandyBoard’s A-D converter reads a voltage between 0V and 5V and outputs this as a digital number between 0-255. There is a linear relationship between this outputted number and the original voltage. The HandyBoard will output 0 if the voltage is 0, 255 if the voltage is 5 and 128 if the voltage is 2.5. The HandyBoard will use this A-D converter to read 2 sensor outputted voltages: one for the current sensor and the other for the odometer (see section 6.2 Current Sensor Circuit and section 6.3 Odometer Sensor Circuit for interfaces). by the larger sealed lead acid batteries. The HandyBoard has 4 small H-bridge motor outputs that are meant to drive small motors. One of these motor outputs will be connected to a relay which will activate the automatic shutdown. The other motor output will be used to take the place of the 5k potentiometer. The HandyBoard is capable of putting out between -9V and +9V. As previously mentioned, the HandyBoard only needs to output between 0V and 4V to mimic the potentiometer. Overall, the HandyBoard will function as the onboard computer in EEEAHBMS. Its purpose it to monitor the system and to collect data during use. It will monitor the speed of the motor, the voltage of the battery, the current of the battery, the voltage of the motor, and various other on-off switches (see section 7 Software Design and Implementation for details) The HandyBoard was recycled from a previous robotics project. While it had no impact on the budget of EEEAHBMS, it originally cost $300. As previously mentioned, sealed lead acid batteries need to be charged in a special way. They require charging at a higher voltage than the normal wet-cell lead acid battery, and are very sensitive to being overcharged. For this reason, an available car battery charger was not appropriate for EEEAHBMS. 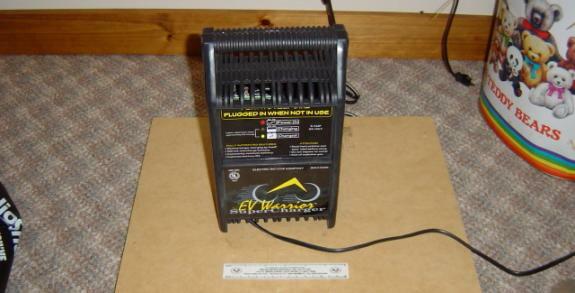 The battery charger purchased for the purposes of EEEAHBMS was the 24V EV Warrior Charger. It was located on the same website that supplied the surplus H-Bridge controller. This battery charger was also in surplus, and was purchased for $50. A normal battery charger of the same quality would cost $80. The EV Warrior Charger has special electronics that make it an effective charger for sealed lead acid batteries. The charger monitors the voltage of the batteries, and when the voltage exceeds a certain threshold voltage, the charger shuts down. Then, when the batteries fall below the threshold voltage, the charger turns itself back on again. This protects the batteries from being overcharged as well as maintaining the batteries at full charge. The EV Warrior Charger is a 5 amp continuous charger. Continuous means that it will provide 5 amps of current no matter how close to fully charged the battery is. This is much more effective than a normal battery charger, where the current decays as the battery becomes more and more charged. The EV Warrior Charger can charge both batteries from no charge to almost full charge in a little over 2 hours. Because it is rated at 24 volts, it is capable of charging both batteries at the same time. In the design portion of EEEAHBMS, it was explained that a mountain bicycle tire would not be compatible with a friction drive system. And, since the prototype bicycle for EEEAHBMS is a mountain bicycle, a new rear tire needed to be purchased. The only tire with a wide, smooth, thick rubber tread that could be found at the approximate size of the old tire was at www.zapworld.com. The old mountain bicycle tire was a 26 X 1.9, which means 26 inches in diameter and 1.9 inches wide. The replacement smooth tire was a 26 X 1.6. It would suit the purposes of EEEAHBMS perfectly. The bicycle tire cost $12. When the mountain bicycle tire was first replaced with the smooth tire, it was discovered that the tire tube was not compatible to the new tire. Since the smooth tire wasn’t the exact width as the mountain bicycle tire, the tube would not fit. So, a trip was taken to Cycle Fitness in Monroe and the appropriate tire tube was purchased for $5.25. While the previous sections enumerate all of the major components that were purchased in preparation for the construction of EEEAHBMS, many small components were also purchased during construction. 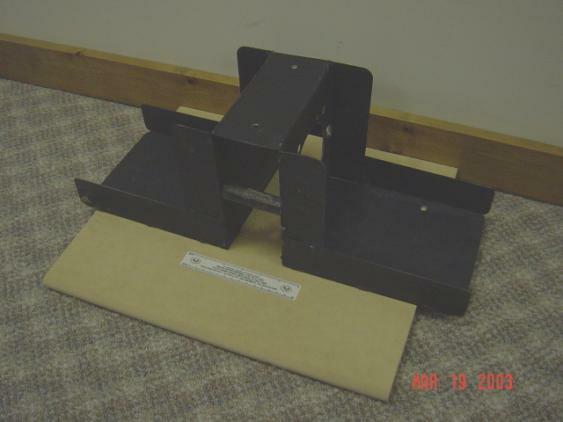 These include nuts, bolts, aluminum angle stock, mounting boxes, wire, connectors, a t-hinge, screws and washers (see section 5 Construction for their use). In addition, many circuitry components were purchased including a circuit board, a photo resistor, an infrared sensor, operational amplifiers, binary circuit counters, resistors and capacitors (see section 6 Electronics for their use). These materials will be enumerated in the context of EEEHBMS construction. The largest part and highest priority of the construction process was the “saddle-bag.” This piece could not be purchased and needed to be welded from scratch. However, before it could be welded, it needed to be designed. And this required the use of Computer Aided Design (CAD) Software. A free copy of the CAD Key ’97 R2 program was available. While it is an outdated program and a limited version of CAD, the picture that needed to be drawn was fairly simple and a current professional version costs over $200. Therefore, CAD Key ’97 R2 was used. CAD Key has 9 different construction views, each with a different orientation of the axes. Five of these construction views are in a 2-D plane, while four are in a 3-D plane. It took much practice to be able to predict what an object in one view would look like in the others. An object could look perfectly acceptable in one view and then be totally distorted in another. And, unless the object looks appropriate in all 9 views, it is not correctly drawn. Translating objects and resizing objects were difficult for similar reasons. When translating or resizing an object in one axis, it is difficult to predict what would happen with relation to the other objects on a screen. A computer monitor is limited in its ability to display 3-D drawings, and therefore a familiarity with the program is necessary in order to predict the results of a translation or resizing. Once a comfort level with CAD Key was reached, measurements were taken of the bicycle, motor, and battery in order to formulate accurate dimensions for the saddle-bag. It would be very undesirable for the saddle-bag to be welded and then to discover that the motor does not fit correctly, or that that saddle-bag will not mount correctly on the bicycle. So measurements were taken, checked, and double-checked. Once all of the measurements were procured, it was possible to begin the drawing. However, a problem was encountered along the way. As accurate as the 3-D CAD drawing could be, it was difficult to understand where certain lines were in relation to one another. So, a color coding system was adopted to differentiate between the pieces of the saddle-bag. However, even with the color coding system, it was still difficult to understand in which plane the holes for the sheave and the mounting of the face of the motor were located. So, two drawings were made. The first was the 3-D picture of the saddle-bag, minus the holes. The second was an “unfolded” version of the saddle-bag, labeled with dimensions and including the holes for the motor. The large hole in Figure 5b is the hole that the sheave slides through while on the motor shaft. This hole allows the sheave to get to the wheel that the two sides of the saddlebag surround. The smaller holes are the holes meant for mounting the saddlebag to the face of the motor. With the drawings finalized, it was time to find a welder to build the saddlebag. In early January, a presentation about EEEAHBMS was given to the executives of the Business Education Initiative on behalf of the Trumbull High School Science Department. The Business Education Initiative (BEI) is an organization of business men and women interested in supporting the local education system. This interest extends to donating equipment, time and funding for experiments. The THS Science Department decided to present EEEAHBMS as an example of an independent student project in hopes of encouraging further investment into the science department. The result of the presentation was that multiple business executives became interested in providing assistance along the course of the rest of the project. John Annick, the CEO of BEI, supplied his phone number if and when aid was needed for the project. When the time came to weld the saddle-bag, it was necessary to call for assistance. John Annick supplied contact information for Art Bradshaw from the Aquarion Water Company in Shelton, CT. A meeting was scheduled, and, after a quick review of the drawings, Mr. Bradshaw said that he would fax the drawings over to Richard Cleri, his welder in Stamford. When the saddle bag was examined for accuracy in front of Mr. Cleri, he noted that it flexed a lot under its own weight. This did not bode well for mounting a 24 pound motor and two 9 pound batteries. So, Mr. Cleri quickly uncovered some scrap half inch metal pipe, and cut two 3 inch pieces using a band saw. These two pieces of pipe were to be mounted between the two sides of the saddle-bag in order to greatly increase its strength. Without the two pieces of pipe, the top sheet metal could not prevent the flexing. Each piece of pipe was attached to the faces of the saddle-bag as in Figure 5c using a 5/8 inch lag bolt with a hexagonal head. A nut was used to secure it in place as well as two lock washers. There are two different kinds of lock washers: toothed lock washers and split locked washers. Toothed lock washers are used for the head side of the screw or bolt and prevent the screw from turning. Split lock washers are meant for the nut side of the screw or bolt. They force the nut to be tightened with a lot of torque in order to flatten out the split lock washer. The split lock washer acts like a spring, flattening out as it the nut is tightened. This spring action keeps the nut secure even if it starts to loosen as the split lock washer will just expand to fill in the extra space. Both a toothed lock washer and split lock washer are used on every bolt in EEEAHBMS in order to provide strength. Once the saddle-bag was strengthened by the addition of the half inch pipe, correctly positioned holes were drilled for the mounting on the motor. After the larger hole was slightly enlarged for the sheave, by using a grinding wheel on a Sears Craftsmen ½ inch drive handheld drill, this aspect of the physical structure was completed. The next task in the construction portion of EEEAHBMS was to make the channel mountable to the bicycle. There are two mounting points: the seat post and the rear axle of the bicycle. The mounting arrangement for the seat post can be seen in Figure 5d. 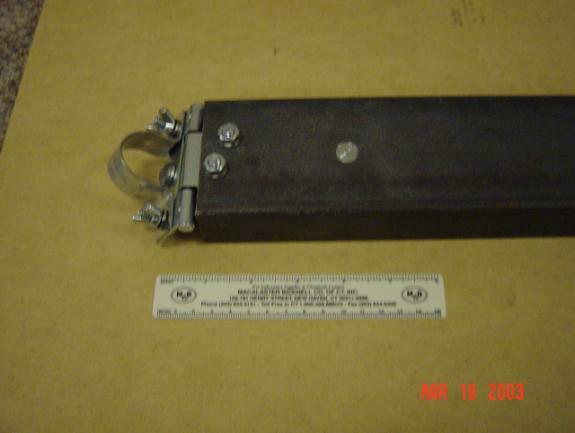 It consists of a T-hinge and piece of 1 inch metal clamp. The T-hinge has three mounting holes, all of which were used in its attachment to the channel. Three ¼ inch holes were drilled in the channel using a small workbench top drill press made in China, model number PTMIN15. Initially, the T-hinge was secured to the channel using a ¾ inch long ¼-20 round head bolt (1/4 inch diameter with 20 threads per inch), nut and lock washers for all three holes. However, later in the construction it was discovered that the rightmost hole in the above picture would block the mounting of the saddle-bag to the channel if a normal bolt and nut were used as planned. Therefore, the screw was changed to a flat head, reversed in its direction (now pointing down) and counter-sunk. Counter-sinking entailed grinding away at the inside of the drilled hole so that the top of the screw would be flush with the channel. With the screw counter-sunk, it would no longer conflict with the mounting of the saddle-bag. The one inch pipe clamp was chosen because it fit snugly around the seat post of the bicycle. A one inch pipe clamp is meant for pipe with an inner diameter of 1 inch, and an outer diameter of approximately 1 ¼ inches -- an exact match for the seat post. The pipe clamp was secured to the T-hinge using two more ¼-20 bolts, wing nuts, and lock washers. Wing nuts were chosen over hexagonal nuts because they are easier to be undone by hand. And, since these are the nuts that need to be removed in order to mount and un-mount the motor system, it was appropriate to emphasize convenience. The final addition to the T-hinge was a ¼-20 bolt mounted to the side of the hinge facing the pipe clamp. The head of this screw serves as a shim, ensuring a firm connection between the clamp and hinge and the seat post. This screw head is ground down to give it more of a concave shape in order to make the contact point between it and the screw head smoother. Figure 5e demonstrates how the support members are connected to the rear axle to support the back of the channel. It is constructed of simple aluminum angle stock. After some experimentation with a pile of screws, it was discovered that the threaded mounting holes in the rear axel accept ½ inch 10-32 screws. However, after experimenting on other bicycles, it was also discovered that European bicycles have a metric standard. Therefore, a different set of screws will be needed to mount to the axle of a European bicycle. With two long pieces of aluminum angle stock mounted to the rear axle, the channel was mountable. Marks were made for the location of the holes on the channel and the appropriate length of the aluminum angle stock. The measurements were made so that the aluminum angle stock would be angled slightly away from the rider for stability. A purely vertical mounting arrangement would not be as strong. To add flexibility to the mounting arrangement, extra holes were drilled into the channel and into the support members. By using a different set of holes, the height of the channel with respect to the wheel, and the angle at which the aluminum angle stock is mounted can be varied. The aluminum angle stock is connected to the channel by the standard ¾ inch ¼-20 bolts. Standard wing nuts and two lock washers are also used. Since all bicycles have different sized tires, the distance from the channel to the rear axle will not be constant. Therefore, in the final design of EEEAHBMS, the aluminum angle stock support will have to have a variable length. This can be accomplished by two pieces of aluminum angle stock that slide over one another. The next step in the construction process was to secure the motor, batteries and control box to the saddle bag. With the large hole enlarged for the sheave and the mounting holes for the face of the motor corrected, the mounting of the motor required only sliding the motor into place and bolting it to the side saddle. However, since the motor is the most important and heaviest of the components of EEEAHBMS, it was decided that redundancy in the mounting of the motor is appropriate. Therefore, while normally either only the motor face mounting holes or the motor base mounting holes are used, both are used for EEEAHBMS. Two holes were marked and drilled with the drill press for the mounting of the base of the motor and the standard ¼-20 screws, hexagonal nuts, and lock washers are used. The mounting of the face of the motor wasn’t as simple as assumed. With the holes drilled, the only step left was to screw into the threaded holes. However, the 3/8 inch bolts purchased wouldn’t fit. It was through this experience that it was discovered that there are two types of threads on large bolts: coarse and regular threads. And, the threaded holes on the face of the motor are made for coarse threaded bolts. Therefore, special nuts had to be purchased as well, with standard lock washers being used. The mounting of the batteries was not straightforward, since the batteries have no mounting holes. The first thought was to strap the batteries to the saddlebag. However, it was quickly realized that this would be highly unstable and the batteries would most likely slide around. Therefore, a more effective design was necessary. The battery mounting design involves a tray which would slide in and out of the saddlebag. The batteries would be clamped to the tray, and the tray would be bolted in place to the saddlebag. The tray’s mounting point would be adjustable, giving it freedom to be mounted farther in or farther out, until it effectively balanced the weight of the motor. Fabricating this metal tray would involve the same steps of fabrication as for the saddlebag. However, with the deadline for EEEAHBMS quickly approaching, this complicated battery tray was added to the future improvements list, and a simpler approach was devised. The problem was that the batteries did not fit snuggly into the saddlebag tray. They had much room to slide around in. So, pink Styrofoam was cut and used as a spacer, making the fit for the batteries tighter. 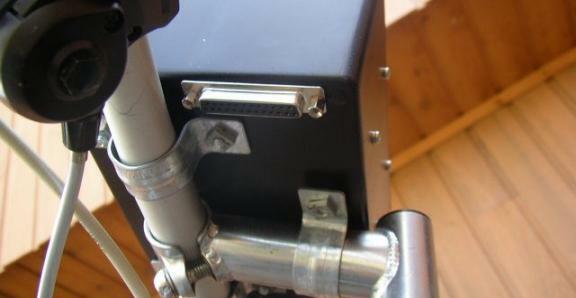 Then, a metal bracket was attached to the back of the saddlebag, securing the motors into place. Once the batteries and motor were mounted to the saddlebag, it was possible to mount the saddlebag to the channel. The channel was temporarily mounted to the bicycle and then the saddlebag was positioned such that the sheave would be placing an acceptable amount of pressure of the wheel of the bicycle. Two holes were marked and drilled using the drill press. Finally, the saddlebag was secured with the standard ¼-20 bolts, hexagonal nuts, and lock washers. There is much flexibility in this mounting system. The point at which the channel attaches to the seat post is one point of adjustment. 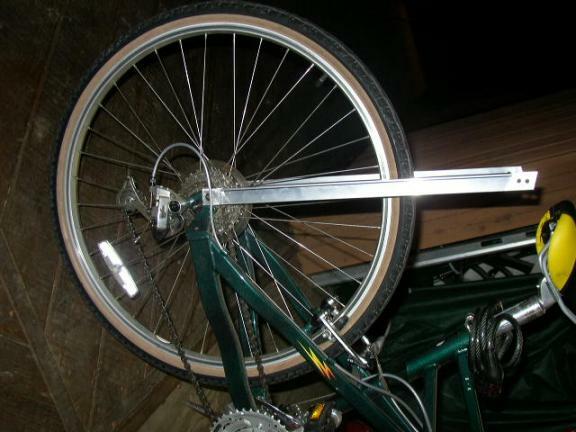 By mounting the channel higher and lower, the sheave puts a varying amount of pressure to the bicycle wheel. The other point of flexibility stems from the mounting of the saddlebag to the channel. The point at which the saddlebag mounts to the channel is not fixed. It can easily be shifted forwards or backwards, depending on the bicycle to which it is being mounted. Therefore, in the final product, additional holes must be drilled in the channel, to allow room for adjustment in the mounting point of the saddlebag. It was necessary to mount an electronics control box to the metal channel. An 8x6x3 Project box was purchased from Radio Shack for this purpose and mounted to the channel directly behind the saddlebag. The control box and its respective electronics can be seen in Figure 5h (see section 6.1.1 Rear Control Box Electronics for more details). The control box was mounted to the metal channel using 1/6-32 screws. Four screws, in pairs of two, were used to mount the control box. Each pair of screws secured a metal bracket to the mounting box, in order to distribute the force across the plastic box. This distribution makes it much more unlikely for the plastic box to crack. The front control box, housing the HandyBoard, potentiometer, voltage dividers, a relay and a power switch, was mounted to the handlebars of the bicycle. 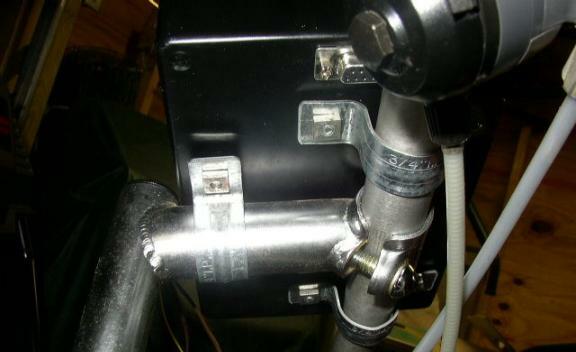 One ¾ inch pipe clamp is attached to each handlebar and a third ¾ inch pipe clamp attaches to the handlebar support. These pipe clamps are mounted to the control box using two 3/16-24 screws each, with square nuts and lock washers. Brackets are used on the inside of the control box for each pair of screws in order to distribute their pressure. Once the saddlebag and control box were mounted to the channel, it was obvious that the channel was longer than necessary. And since the channel is very heavy, trimming it would be beneficial to EEEAHBMS. However, trimming metal channel is easier said than done. The tool necessary to do this needed to be found. The metal channel was brought to the school’s metal shop and Larry Farrell was very helpful. He interrupted a Basic Electricity course to trim the metal channel. Using a band saw, which uses its own weight as the force pressing the saw into the metal, 7 inches of the channel was chopped off. Using a band saw ensures a straight and smooth cut. On most bicycles, the rear reflector is mounted to the seat post. However, with the channel mounting to the seat post, the rear reflector would have to be removed. And, since the rear reflector is a safety requirement for bicycles in most states, this posed a problem. The solution to this problem was simple. The rear reflector was remounted to the very edge of the channel as can be seen in the above pictures. Only a hole needed to be drilled. The life of the reflector, however, was short-lived. It was destroyed during the first test run and will need to be replaced. Once the physical structure of EEEAHBMS was constructed, the electronics needed to be designed and implemented. All analog circuits were designed using OrCAD – Demo Version 1999. This is a free downloadable demonstration version of an electronic CAD program. It is used to design and simulate analog circuits. Only the design function was used however. Succeeding in having OrCAD simulate circuits was difficult because it required meticulous attention to the connection of wires and the use of symbols. It is much more practical to draw and label the circuits using OrCAD and test the circuit by actually building it. The process used to learn OrCAD was very similar to the process used to learn CADKey ’97, the main method being experimentation. All digital logic circuits were designed and simulated using LogicWorks 2001 Version 4.1. This program was loaned by Jeffrey Denenberg, a college professor who uses it for a Digital Logic course at Southern Connecticut University. The process for learning how to use this program included guidance from Jeffrey Denenberg and some self-guided experimentation. There were three main circuits that needed to be designed and implemented: a circuit connecting the batteries, controller and motor, a current sensor circuit, and a odometer circuit. There are two halves to the first circuit: the half mounted in the rear control box and the half mounted in the front control box. The two halves are connected via a 25 conductor with male to male DB-25 connectors (see Appendix B Electronics Connections for details). The female ends of the connectors are mounted on the side of each control box. The holes for these female connectors were shaped by first drilling a few holes and then filing away the plastic between these holes with a ¼ inch rotary rasp drill bit. The final cleanup was done with an assortment of files. The odd shape mounting hole was needed because the DB-25 cable has a trapezoidal shape. The female end of the connector also has two screw holes which are mounted by special computer screws and nuts. These screws and nuts were found by salvaging parts from an old broken computer. Lock washers were added to handle vibration. Also, since the front control box is mounted to the bicycle handlebars which turn, the dressing of the DB-25 cable needs to be appropriately handled. The manner by which it is secured to the frame of the bicycle needs to allow slack for the turning of the handlebars, prevent tangling and make sure that the DB-25 does not interfere with the rider. 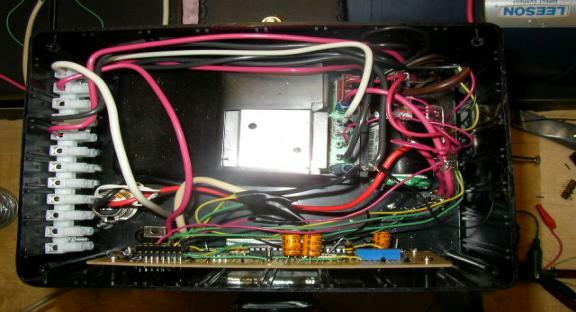 When the front control box was first mounted, it was realized that a mistake had been made in mounting the female end of the DB-25 connector. It was mounted in the path of the handlebars of the bicycle, making it impossible to connect. For this reason, it had to be shifted farther to the corner of the bicycle, away from the pipe clamps. 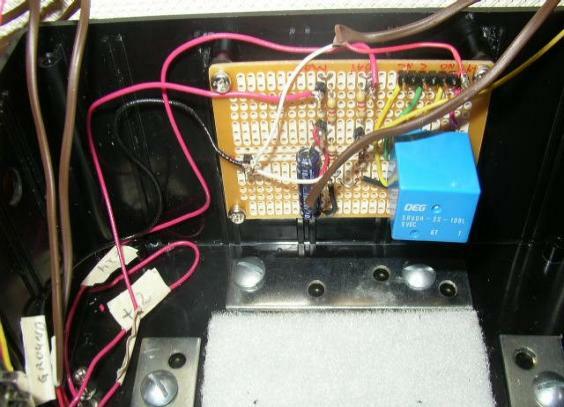 The Curtis H-Bridge controller is mounted in the rear control box using Velcro, making its removal very simple. Referring back to Figure 4g, a diagram of the wiring of the Curtis controller, the motor is connected to the upper M1 pin and the lower M2 pin. The M1 pins are for the positive side of the motor and the M2 pins are for the negative side of the motor. The Curtis H-Bridge is equipped to control two motors. Figure 6c shows the 4 switches that create the H-bridge. Switches U2 and U3 flip together and opposite to switches U4 and U5. When switches U2 and U3 are on, the motor is connected positively across the batteries. When switches U4 and U5 are on, the motor is connected negatively across the batteries. 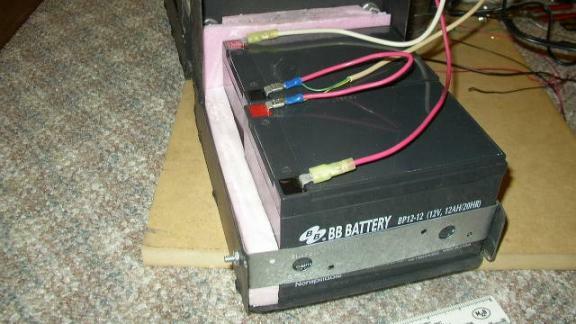 Again referring back to Figure 4g, the two 12 Volt batteries are connected to the B+ and B- pins. The B+ pin is for the positive end of the battery and the B- pin is for the negative end of the battery. In parallel with the Curtis controller and the Leeson motor is the XLR charging socket. While the male plug was already attached to the EV Warrior charger, the female socket needed to be ordered separately from the same source for an extra $4.00. The EV Warrior adopted the XLR standard from professional audio low impedance microphone connectors. The female end of the socket is mounted to the bottom of the control box in a ¾ inch hole with two 6-32 countersunk flathead screws. Hexagonal nuts and lock washers are used. This setup provides an easy way to connect the battery charger to the batteries. Connected in series with the H-bridge controller is a 30 amp continuous duty illuminated power switch. This switch serves as the system’s main on-off switch. At any point, this switch can be toggled, disabling the system. The light provides an indicator as to whether the switch is on or off. However, the light is only rated at 12 Volts and therefore needed to be connected between the two batteries. A diode was added into the circuit to prevent any backwards flow of electricity from the second battery to the light bulb, protecting the light bulb when the power switch is off. The final piece of this circuit is a type TL 30 amp time delay fuse that is connected in series with the Curtis controller. This time delay fuse is the hardware shutdown for when the current is too high. This fuse will only blow if more than 30 amps are pulled constantly for a period of time. For around 35 amps, that period of time is a minute. For 40 amps, it is 20 seconds. For 60 amps, it is almost instantaneous. This time delay function is compatible with EEEAHBMS because the system can handle up to 80 amps for a minute. Motors, when accelerating, cause the current to surge. This would not be compatible with a fuse that blew instantly when the current spiked. And, even with the time delay, the 30 amp fuse is conservative. To make the connecting and disconnecting of wires inside the control box easier, a European style barrier strip was added. All power wires entering and leaving the rear control box does so via the barrier strip. The barrier strip can be seen in Figure 5h, mounted on the left side of the control box. For wires entering the rear control box, holes needed to be drilled into the bottom of the control box for easy access. In order to protect the wires from the sharp edges of the drilled holes, and to make the wires have a snug fit, vinyl grommets were used. These vinyl grommets were purchased from Radio Shack for $2.00. Referring back to Figure 4g, pins 4, 5, and 6 of the Curtis Controller, the pins for the potentiometer, are connected to the front control box via the DB-25 cable. Between the connection of the wiper lead of the potentiometer to the H-Bridge and the lead of the wiper that connects to the variable resistor are two switches: one relay switch and one double-pull double-throw switch. Both of these switches need to be closed or the motor stops. If either switch is off, the desired speed is set to zero. The relay switch is a switch controlled by the HandyBoard. It is only thrown if the bicycle is moving at a minimum of 3mph. This is a safety measure enumerated in Section 3.5 Safety System to prevent the bicycle from taking off before the rider is ready. The relay is soldered on a printed circuit board which is mounted inside the front control box with 10 mm standoffs. These standoffs use 3-2 X 5mm screws and lock washers to mount to the board and to the box. The double-pole double-throw switch is the operational on-off switch for the motor. One pole tells the HandyBoard what status the switch is in and the other pole is connected to the motor. The desired speed will only increase above zero if the switch is closed. It is mounted in a ½ inch hole on the side of the front control box. The potentiometer is mounted to the side of the front control box, through a 5/16 inch hole. The potentiometer is equipped for mounting with its throat being threaded and having an appropriate hexagonal nut included. And, another 1/8 inch hole was drilled for the peg that prevents the potentiometer itself from turning when the dial is turned. The potentiometer’s voltage is outputted to the Curtis controller which uses the voltage to place a voltage on the motor, and to the HandyBoard which will interpret this voltage and display the desired speed of the bicycle. This setup is temporary until the HandyBoard is capable of controlling the speed directly. The voltage dividers are used to reduce the voltage of the batteries and the motor to the range that the HandyBoard can read. The maximum voltage that the batteries can provide is 26 volts, and the maximum voltage that the HandyBoard can read is 5 volts. Therefore, the voltage that the HandyBoard is reading needs to be reduced to 1/6 the voltage of the batteries and the motors. And, this is exactly what the two voltage dividers do. The first voltage divider allows the HandyBoard to read the motor voltage. It has a 4.7k resistor in series with a 1k resistor, lowering the voltage at the point between the two resistors to approximately 17.5% of the original voltage. The HandyBoard will read this voltage and display the appropriate motor voltage. However, because the motor voltage is constantly switching from positive to negative due to the H-bridge controller, it needs to be averaged out. This is accomplished by placing a capacitor in parallel with the voltage divider. The charging and discharging of the capacitor in response to the flopping of the sign of the voltage serves to average out the voltage of the motor for the HandyBoard. The capacitor used is a 10,000 nF capacitor (10 X 10-6 Farads). The size of the capacitor was chosen in order to make the reactance (capacitor equivalence of resistance) of the capacitor small compared to the resistor it was across. The smaller the reactance of the capacitor compared to the resistance of the resistor, the smaller the effect the alternating voltage has. The reactance of a capacitor can be calculated as 1/(2p X Frequency X Capacitance). The frequency of the motor voltage is 1 kilohertz, making the reactance of the capacitor approximately 16 ohms, 2/125 that of the 1k resistor. The second voltage divider allows the HandyBoard to read the battery voltage. Since the battery voltage is not alternating, no capacitor is needed. Therefore, this voltage divider consists of only a 4.7k resistor and a 1k resistor. 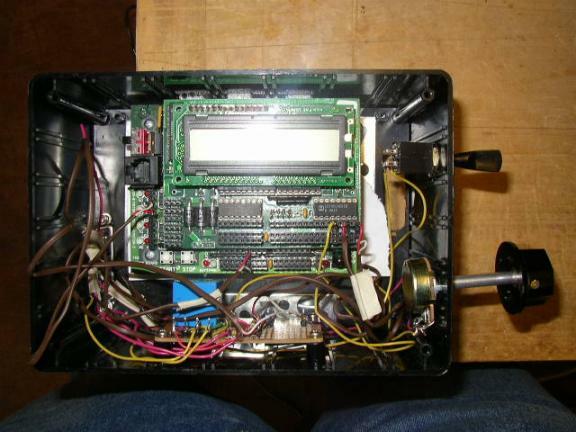 The HandyBoard Computer is mounted in the front control box using Velcro, making its removal very simple. One of the primary jobs of the HandyBoard is to monitor the current of the batteries in order to calculate the power entering and leaving the batteries. However, the HandyBoard is only equipped to read voltage and not current. Therefore, a method needed to be devised in order to make the reading of the current of the battery possible. 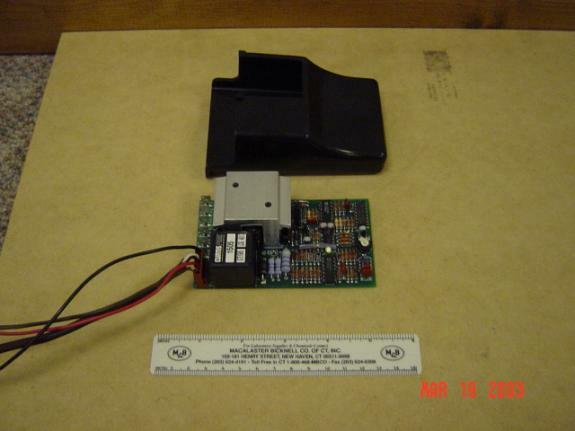 The Curtis H-Bridge controller has a current sensor that can be connected to the motor, and initially it was thought that this would be the solution. However, as previously mentioned, after some quick testing, it was determined that the current sensor of the H-Bridge was not reliably accurate. According to Ohm’s Law, V=IR, voltage is directly proportional to both current and resistance. With a constant and known resistance, either voltage or current can easily be calculated if the other is known. Therefore, with a known resistance connected to the battery, if the voltage difference across the resistor can be read by the HandyBoard, the current of the battery can easily be calculated. This is the method that is used for reading the current of the batteries in EEEAHBMS. However, this is not as straightforward as it appears. One of the main goals of EEEAHBMS is efficiency. Having a resistor in series with a battery for the purpose of obtaining a current reading is not consistent with this goal: given the high currents that will be produced by the batteries, every ohm of resistance implies a high loss of energy. Therefore, it was desirable to find the smallest resistor possible. edf/info/wire-resistance.html. According to this table, 12-gauge wire has 1.7 ohms of resistance for every 1000 feet. A few calculations were made with this data. 1.7 Ω / 1000ft = 1Ω / 588.235 ft = .001 Ω / .588 ft = .001 Ω / 7.05 inches. Therefore, 7 inches of 12-gauge wire could be used as the equivalent of a 1 milliohm resistor. Such a small resistance is perfect for the purposes of EEEAHBMS. Yet, using such a small resistor introduces another problem. While the HandyBoard can read any difference of voltage between 0V and 5V, its measurement granularity is not fine enough to read differences across such a small resistor. For example, if the battery is pulling a current of 20 amps, the voltage difference across the milliohm resistor would only be 20 millivolts, a voltage much too small for the HandyBoard to read. To solve this, an Operational Amplifier, or an OpAmp, which amplifies a voltage difference was employed. ΔV of output = -ΔV of input X (R2/R1). Therefore, the gain of the operational amplifier is equal to the opposite of the ratio of R2 to R1. The OpAmp also has an internal mechanism to fine-tune its output when the voltage difference of the input is zero, or zero-point. This mechanism is called offset null. If the ends of a potentiometer are connected to pins 1 and 5, and the wiper is connected to ground, the adjustment of the wiper will adjust the zero-point of the Operational Amplifier. For the purposes of EEEAHBMS, the circuit in Figure 6i was designed. The HandyBoard can read a voltage from 0V to 5V and this voltage needed to correspond to a current range of approximately 100 amps (-50 amps to +50 amps). Therefore, the middle of the voltage range, 2.5V, needed to correspond with zero amps. So, a 5 volt regulator, powered off of the 24V supply, was used as the upper voltage input for the OpAmp. With the lower input being ground, the zero point of the resistor was 2.5V. With the range of the OpAmp set at 0V to 5V, the two inputs from the battery when the current was zero to the OpAmp needed to be around 2.5 volts as well. Therefore, a voltage divider was needed to reduce the voltage inputted to the OpAmp from 13V to 2.5V. The voltage divider used was a 4.64k resistor in parallel series with a 1.00k resistor. This reduced the voltage from 13V to 2.3V. While this is not exactly 2.5V, it does not pose a problem. It can be tweaked using the offset null adjustment. And, even if it is not adjusted, it only limits the lower range of the current sensor. And, because the bicycle will only be operating between -20 amps and 20 amps on a regular basis, not being able to read below -45 amps will not be problematic. Carbon resistors are made of a cylinder of carbon encased inside plastic. Its resistance rating is determined by the shape of the cylinder of carbon. If the carbon cylinder is long and skinny, the resistor will have a high resistance. If the carbon cylinder is short and fat, it will have a low resistance. These resistors are not terribly accurate. Metal film resistors are made of an insulated cylinder surrounded by a metal film and encased inside plastic. These resistors are more accurate. The resistance of the resistor is determined by the shape of the resistor and the amount of metal in it. The more metal, and the shorter and thicker the resistor, the lower the resistance. Wire wound resistors are exactly what they are named: wire wrapped around a insulating cylinder and encased in plastic. While these resistors are accurate, they are normally used to handle high power circuits. The resistance of these resistors is determined by the length and the gauge of the wire used. The longer the wire and the higher the gauge, the higher the resistance. Thick film resistors are the most accurate. They are made with a piece of ceramic that has a groove in it. This groove is filled with a carbon paste that is fired to harden. Finally, the resistor is milled down under machine control until the desired resistance is reached. These resistors only have 1% error. Because they are the most accurate, thick film resistors were used for the voltage dividers of the OpAmp circuit. Finally, the gain of the OpAmp needed to be calculated. With an increase of 2.5 volts corresponding with 50 amps, an increase of one amp should correspond with an increase of .05 volts. Without the OpAmp, the current increase of one amp corresponded with a voltage increase of .000177V (the voltage divider decreased in from .001V). Therefore, the gain needs to be .05V / .000177V = 282. Accordingly, the gain needs to be approximately 300. In the current sensor circuit, the two resistors that determine the gain are the 270k resistor and the 4.64k resistor. However, the 4.64k resistor is essentially in parallel with the 1k resistor when looking backwards at that piece of the circuit, according to the Thevenin equivalent circuit. A 4.64k resistor in parallel with a 1k resistor is the equivalent of an 823 ohm resistor (1/4.64k + 1/1k = 1/.823k. When calculating resistors in parallel, they add as inverses). Therefore the gain of this OpAmp is 328, approximately what was needed. In parallel with the 270k resistor is a .47 microFarad capacitor, for the same reason the capacitor was used in the motor voltage divider circuit. The battery current is continually flopping and this capacitor averages out the current. Finally a 10k-Ohm 15-Turn Linear Taper Cermet Potentiometer was used as the offset adjustment for the operational amplifier. The potentiometer allows for a very fine adjustment for the zero-point; it takes a full turn to change the resistance a mere 667 ohms. Another of the primary purposes of the HandyBoard is to monitor the speed at which the bicycle is traveling and the total distance it has traveled. In other words, the computer needs to know how many times the bicycle wheel has turned. And, since the number of turns of the motor sheave is directly proportional to the number of turns of the bicycle wheel, monitoring the motor sheave was also an option. There are two general methods for monitoring the rotation of the wheel: an optical sensor and a magnetic sensor. If implemented correctly, both methods work equally well. The optical sensor method was chosen because of HandyBoard accessories described below. The optical sensor method revolves around Einstein’s Nobel Prize winning photo-electric effect. In this reaction, a photon comes and knocks electrons out of a semi-conductor structure, creating free electrons for current to flow. Therefore, when light (a stream of photons) is shining on the semi-conductor, there is little resistance across it, and when light is not shining on it there is high resistance across it. The photo-resistor lead gets placed in series with a 47k resistor with a 5V input. Therefore, the point in between the photo-resistor and the 47k resistor is a voltage divider. When the infrared light bounces off the object and comes back to the light sensor, the resistance is very low in the photo-resistor and, therefore, the voltage at the point between the resistors is close to 0V. When the light sensor does not see any of the reflected infrared light, the resistance of the photo-resistor is high and the voltage at the point between the resistors is close to 5V. This cycling between 0V and 5V is a pattern that the HandyBoard can monitor. The next step was to devise a mechanism to coordinate this cycle with the rotation of the sheave. This was accomplished by covering half of the circumference of the sheave with an aluminum tape and the other half with electrical tape. When the sensor is in line with the aluminum tape, light reflects and the voltage is low. When the sensor is in line with the electrical tape, little light will reflect and the voltage is high. Therefore, a cycling of the voltage corresponds to a rotation of the sheave. The next step was to mount the LED and light sensor onto the saddlebag and close enough to the sheave so that it would be effective. On the battery side of the saddlebag, a ¾ inch hole needed to be drilled. However, such a large hole is difficult. So, a 3/8 inch hole was drilled and then a chasis-punch drill bit was used to enlarge the hole to ¾ inch. And, finally, a grinder was used to enlarge the hole a little more until it was the correct size. This mounting hole was used for a ½ inch poly-pipe to threaded pipe adapter. The threaded side of the adapter was used to mount to the saddlebag along with a nut from a Romex electrical connector. The pipe was then cut to the appropriate length so that the end of the pipe is less than a half of an inch away from the sheave. The light sensor and LED are glued to a piece of wood which is glued to the inside of the pipe. 1. First it needed to clean up the output voltage from the light sensor so that is it either 5V or 0V, not almost 5V or almost 0V. 2. Then, it needed to slow the cycling from 5V to 0V down to a speed that the HandyBoard can effectively monitor. To accomplish the first goal, a comparator was used. A comparator is an OpAmp without the feedback loop, giving it infinite gain. Therefore, the comparator will either output its upper bound voltage or its lower bound voltage, depending on the difference in voltage of the two inputs. The upper voltage of this comparator at pin 3 is 5V and the lower voltage of this comparator at pin 12 is ground. Pin 4’s input is the result of a voltage divider which cuts the 5 volts in half down to 2.5V. And, pin 5’s input is from the optical sensor. If light is being reflected, the optical sensor’s output will be close to 0V. And, since this is lower than the 2.5V of the other input, the infinite gain of the Comparator causes its output at pin 2 to be 0V. If light is not being reflected, the optical sensor’s output will be close to 5V. And, since this is above the 2.5V of the other input, the infinite gain of the Comparator causes its output at pin 2 to be 5V. Now, the output from the optical sensor is truly alternating between 0V and 5V. The second goal of the odometer circuitry was necessary because of the high speeds at which the sheave is rotating. At full load, the motor can rotate the sheave at 1800rpm, or 30 times a second. This would cause 30 full cycles of the voltage, leaving the HandyBoard with 60 changes a second to be monitored. And, the HandyBoard is just not capable of monitoring something that moves this quickly. So, in order to solve this problem, a 7493 4-bit binary counter chip was employed. Figure 6l shows how a 7493 binary counter chip is employed as a 16 bit frequency divider. If the alternating voltage from the odometer comparator is inputted to CLKA as shown above, Bit A will change voltage once for every complete cycle of the input. Therefore, its frequency is one half that of the input. Since the output of A is connected to the input of B, Bit B will change voltage once for every full cycle of Bit A, making its frequency ¼ the original frequency. Due to internal connections, Bit C will change voltage once for every full cycle of Bit B, making its frequency 1/8 the original frequency. And finally, Bit D will change voltage once for every full cycle of Bit C, making its frequency 1/16 the original frequency. Bit D’s alternating voltage is then outputted to the HandyBoard, at a rate that the HandyBoard can handle. Pins 2 and 3 are reset leads which are grounded to avoid all the bits being set to zero accidentally. The current sensor circuit and odometer sensor circuit are both soldered onto the same printed circuit board. Each vertical column of 5 holes in the above circuit board is connected by a copper foil trace on the rear. The top and bottom horizontal rows are each fully interconnected. All wires that attach to the board do so through a 16 pin header (see Appendix B Electronics Connections for details). This header connectorizes the board, making its removal convenient. This printed circuit board is mounted to the inside of the rear electronics box the same way that the other printed circuit board was mounted to the front electronics box: it uses four 10 mm standoffs that use 3-2 X 5mm screws and lock washers to mount to the board and to the box. In parallel with the development of the physical structure and electronics of EEEAHBMS, the HandyBoard software was designed and implemented. Before any programming, or designing, could begin, a comfort level with Interactive C (IC) needed to be obtained. Even though IC 4 is available as freeware, IC 3.2 was used for EEEAHBMS. IC 3.2 is an older commercial version that was already familiar from previous projects. The majority of the knowledge about programming came from lessons given by Steven Buroff, a professional programmer. Steven Buroff served as the software mentor for EEEAHBMS, providing a solid background in programming and answering questions during the process. Steven Buroff also pointed to online tutorials and documentation on IC which proved to be invaluable during the programming process. When it was downloaded and run, the LCD screen of the HandyBoard displayed a blinking heart instead of the F. So, it was made clear that the last character in the second row of the LCD screen was not available for displaying. This program took a number and stored it in the persistent variable. Then it proceeds to increment it, and display the original value and the final value for the persistent variable. When power cycled and run again, the program retained the new value, demonstrating that the persistent variable function does indeed work. Store last battery voltage into a persistent variable. Once the System Requirements were enumerated, the next step was to compile a Software Requirements Document. The goal of this document is to enumerate all possible software requirements for initial and future phases of the project. This document should be able to answer all questions regarding software functionality (see Appendix C Software Requirements Document). The Software Requirements document went through multiple revisions. Each time a draft was completed, Steven Buroff would review it and ask questions that were not answered in the document. Using these questions as comments, the Software Requirements document was edited to be more precise and complete. Some pieces of the software requirements document were so complicated and difficult to explain, that they required the writing of pseudo-code. Pseudo-code is words in the form of programming that give the general idea of how the piece of the program will be implemented. The software must read the voltage of the battery and motor. The software must read the battery current. The software must calculate the power entering and leaving the battery independently using the data from above. The software must monitor the distance traveled and current speed. The software must read the potentiometer for an indication of desired speed. The software must cycle through display modes and monitor a user input to freeze and increment the display mode. The software must have the safety feature that the motor will not activate until the bicycle is already moving. The software must monitor a system on-off switch that, when switched off, sets the desired speed to zero. While the Software Requirements Document enumerates functions far beyond this list, these became the Phase I functions. The rest of the functions of the Software Requirements Document were added to the next steps list (see section 10.1 Complete Software), due to the deadline for the project. The program written has 5 separate files (see Appendix D EEEAHBMS Software). The first file is bike.lis. This file only contains the names of the other four files. When downloaded to the HandyBoard, the HandyBoard automatically downloads the other four files. This is a function of IC 3.2. The second file, globals.c, initializes all global variable, configurations, constants, and defines all analog and digital ports for the other three files. A global variable means that the variable is available to all files. This is as opposed to a local variable which is only available to the file it is defined in. The third file, main.c, begins by initializing a few local variables and constants. Main.c then starts three concurrent processes. Two of these processes (watchAnalog() and watchDigital()) are in sensors.c and the third process (watchTime()) is in time.c. Main.c then starts an infinite while loop which sets up local variables, and checks the on-off toggle brake switch on the front box. If the switch is off, it defines the bicycle to be in a stopped true state, setting the desired speed to zero and energizing the relay. If the switch is on, it defines the bicycle to be in a stopped false state, de-energizing the relay and allowing the bicycle to have its desired speed set by the potentiometer. However, since the HandyBoard does not yet have control over the motor, only the energizing and de-energizing of the relay has any effect. The infinite loop also tests whether the motor voltage is above a certain threshold. The threshold corresponds to the motor running at 3mph. If false, the motor is placed in the stopped true state, preventing the motor from running. If true, the motor is placed in the stopped false state. This is the safety measure which prevents the bicycle from moving before the rider is ready. Main.c also uses the information collected from the sensors in sensors.c to calculate the total energy in and out of the battery independently. These numbers are displayed in Watt-hours. And finally, the infinite loop displays the display which corresponds to the current display mode determined by time.c. The fourth file, sensors.c, is in charge of most of the system’s sensors. Sensors.c defines the process initialized by the pressing of the start and stop button on the HandyBoard. The pressing of the stop button freezes the display mode on the display that it is currently in until the button is released. Once the button is released, the display modes begin to cycle again. The start button, when pressed, resets all persistent variables. Sensors.c also contains the watchAnalog() process which was initialized by main.c. WatchAnalog() is the process that monitors the motor voltage, the battery current and the battery voltage. In addition, sensors.c also contains the watchDigital() process, which was also initialized by main.c. The watchDigital() routine looks for an increase or decrease in the desired speed (not yet in use), the position of the on/off brake switch and does the odometer and speedometer functions. WatchDigital() counts each of the 16 rotations of the sheave and calculates the speed and distance traveled with this data. The final file, time.c, sets some local variables and resets the system time to zero. Resetting the system time to zero every time the program is power-cycled allows the user to know how much time has elapsed since the system was powered. Time.c then starts an infinite loop which looks for the press of the stop button. And, time.c is in charge of the cycling the displays every 5 seconds if the stop button is not pressed. As the components of EEEAHBMS were completed, they needed to be tested and debugged. Then, as a whole, the system needed to be tested. And finally, once EEEAHBMS was demonstrably functional, data was collected and analyzed. The entire front control box was missing. The HandyBoard would not be monitoring any sensors, because the sensors had not yet been finished. The software was also incomplete. But, at that point in time, the mounting system could be tested, and the basic functionality of EEEAHBMS could be confirmed. The only piece of electronics that needed to be added temporarily was the potentiometer. Since its home, the front control box, was non-existent, it was temporarily wired up and mounted to the back of the channel. Testing, however, was not as simple as riding the bicycle around the block. There was no guarantee that EEEAHBMS would be safe. Therefore, an alternative methodology was sought. Conveniently, a teaching professional at the Tennis Club of Trumbull, Danielle Lenois, owns a CycleOps cross training bicycle stand, and was willing to lend it out for short periods of time. The stand is perfect for testing because it lifts the rear wheel off of the ground, allowing it to freewheel. In other words, the rear wheel could be powered without the bicycle moving. After demounting her bicycle, the stand was taken home for the initial testing session. 1. The pipe clamp that mounts the channel to the seat post of the bicycle has a tendency to slip downwards under the weight of the motor and batteries, even when fully tightened. 2. The entire system was a little unstable left to right. The sheave did not always remain centered around the bicycle wheel. The first problem was easily solved. A 1 ½ inch stainless steel hose-clamp was tightened to the seat post right below the point that the pipe clamp mounted to the seat post. The hose-clamp was tightened such that it could not slip, and therefore, the pipe clamp could no longer slip. The other fault, however, was not easily repaired. While solutions were devised (see section 10.2 Stabilizing Physical Structure for details) they required major mechanical work. And, since it did not hinder the functionality of EEEAHBMS, the repair was not a priority and added to Next Steps. 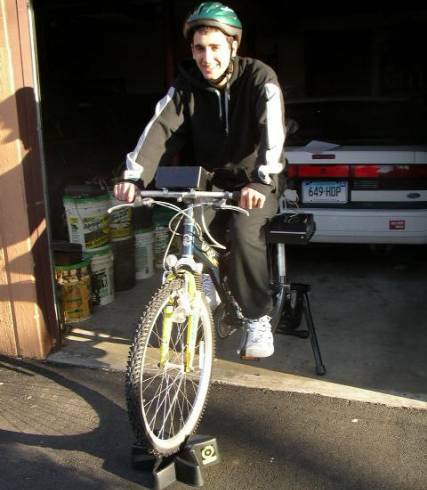 Once the mounting system was debugged, the bicycle was mounted onto the bicycle stand and tested. The results were promising. When the potentiometer was turned, the motor turned on and turned the wheel. The farther the potentiometer turned, the faster the motor turned. When a current meter was placed in series with the battery, a reading of 10 amps corresponded with full speed, well within the systems rating of 20 amps continuous duty. When the potentiometer was quickly turned back down to zero, the meter demonstrated the regenerative braking system slowing down the bicycle with a brief moment of negative current. The next test was with a rider on the bicycle. The motor was again turned to full speed with the potentiometer, and the meter read 10 amps. When the rider began peddling and “helping” the motor, the meter’s reading began to drop. When the rider peddled as fast as he could, the meter’s current reading went negative, demonstrating that the rider was placing more energy into the system than was needed for that desired speed. And that energy was being funneled back into the motor. These tests on the bicycle stand demonstrated that EEEAHBMS was functional as both a motorized bicycle and a regenerative braking system. Once these tests were complete, it was decided that it would be appropriate to test the bicycle off of the bicycle stand. The tester mounted the bicycle, slowly turned up the speed of the potentiometer and then rode around a driveway at approximately 3mph. Everything was running smoothly until the rider decided that it was time to stop. Stopping was a problem because the speed control was behind the rider, and the rider was not adept enough to steer the bicycle with one hand. The handbrakes were pressed, but the bicycle reacted to the braking by simply pulling a surge of current. And, since the emergency off switch was yet to be connected, stopping was difficult. The test run came to an abrupt halt when an effort to reach the potentiometer resulted in steering the bicycle into a bush. In a last ditch effort to stop the bicycle, the rider put his feet down, causing the bicycle to flip. 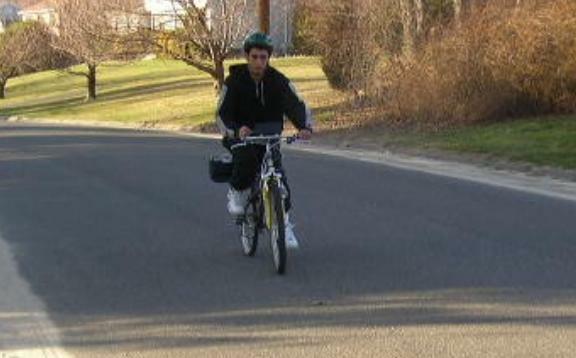 Always wear a helmet when riding a bicycle (Figures 8b and 8c demonstrate this mistake). Never test a system before the safety features are enabled. If proper measures had been taken to ensure a method of stopping the bicycle, this would not have occurred. After the current sensor was wired according to Figure 6i, it was ready to be tested. The sensor was connected to the 1 milliohm resistor connecting the batteries and then a voltage meter was connected to the current sensor. When the current in the battery is 0, the current sensor should be reading 2.5V. It was reading approximately that, and with some adjustment of the zero point through the offset null function, it read 2.5V. However, as soon as the potentiometer was turned on and the motor began to move, the voltage reading from the current sensor started to jump around. And, it was moving unpredictably. At first, it was thought that the current sensor was being asked to amplify too weak of a signal. So, the 7 inches of 12 gauge wire that made the 1 milliohm resistor was replaced with 7 inches of 22 gauge wire. This piece of wire had about 10 times the resistance, and, according to Ohm’s Law (V = IR), would have 10 times the voltage differential across it. With the strength of the signal amplified by 10, the gain of the OpAmp no longer needed to be 300; it needed to be one tenth that, or 30. So, to achieve this new gain, a 33k ohm resistor was placed in parallel with the 270k ohm resistor. The new equivalent resistance was 29.4k ohms. Therefore, the new gain of the OpAmp would be 29.4k ohms / 800 ohms = 36.75. This would be close enough for the purposes of the EEEAHBMS current sensor. While a stronger signal did help, the current signal was still acting unpredictably. As soon as the potentiometer was turned on, the voltages that the OpAmp outputted were variable. After hours of unsuccessfully trying to debug the current sensor, the problem suddenly became obvious. When the potentiometer is turned all the way to zero, the H-bridge actually turns off. Therefore, the problem with the current sensor was occurring as the H-bridge turned on -- when the potentiometer was turned up. It turns out that the H-bridge was creating magnetically induced noise. As soon as the H-bridge is turned on, high currents began flowing in wires near the current sensor, and the magnetic fields created by these wires induced currents and voltages in the current sensor wires. And, since the current sensor is reading such a small voltage, any magnetic noise had a drastic affect on its output. In order to try to eliminate the effects of the noise, capacitors were added to the circuit (see Figure 8e). The first capacitor to be added to the circuit was 4.7 microfarad capacitor across the 5V power supply. This helped the current sensor slightly. The next capacitor to be added to the circuit was a 1 microfarad capacitor on the input wire to the OpAmp from the batteries. While this also helped slightly, the current sensor was still struggling. The last two capacitors to be added to the circuit were also 4.7 microfarad capacitors. They were placed across the resistors on the input to the OpAmp. With the addition of these capacitors, the problem with the current sensor had been solved. The debugging of the current sensor was successful, although tedious. Once the current sensor was functional, the software had to be adjusted in order to read the values correctly. This adjustment involved calibrating some constants so that the HandyBoard correctly interpreted the current sensor. After the odometer was wired according to Figure 6k, it was ready to be tested. The LED and photo-resister were mounted in the tube about a half of an inch away from the sheave and the potentiometer was turned on. As it should, the current sensor was outputting alternating voltages of 0V and 5V every 16 rotations of the sheave. It was functioning correctly and no debugging was necessary. Once the odometer was proven to function correctly, the software needed to be calibrated so that it accurately calculated distance traveled from the alternating voltages. Once the calibrations were made, the HandyBoard’s displayed distance was compared to an estimation on how far the motor had traveled using an approximate rotation speed over a 3 minute interval. When the estimation and the display of the HandyBoard corresponded within 8%, the functionality of the odometer was proven. 1. IC is an interpretive language, not a compiled language. As such, it interprets one command at a time rather than compiling everything at once. This allows the debugging to be done on a command by command basis, rather than trying to debug an entire program at once. 2. The software for EEEAHBMS, in terms of complexity, is relatively straightforward. The majority of errors were syntax errors, and while these are frustrating, they are relatively easy to repair once they are identified. A good example of a syntax error is an If statement. When making an If statement, you test to see something is true. For example, IF x = y, do this. However, this command will not function to test if x = y. If will set x = y and therefore, this command is always true. The correct syntax for the If statement is If x == y. The double equals symbol means “test for” in IC. While the missing equals sign is a simple error, it will prevent software from functioning. Once all of the different components of EEEAHBMS were successfully tested, it was time to test the entire system at once. The CycleOps bike stand was once again borrowed from Danielle, and the bicycle was mounted onto it. During the mounting procedure, a problem was encountered: the power wires from the control box to the batteries interfered with the wing-nut that secured the aluminum angle stock to the channel. While this was mildly inconvenient, the problem was easily solved by reversing the screw and having the wing-nut on the inside of the channel. Once EEEAHBMS was mounted entirely, the problem of the system shifting left to right was reevaluated. The shifting problem stemmed from the imbalance in weight of the motor and the batteries. This caused the motor side of the saddlebag to sit lower than the battery side of the saddlebag. The attempted solution to this problem was to have the aluminum angle stock hold the motor side higher than the battery side. However, this solution was not a fine enough adjustment and the use of a different hole on the battery side only worsened the instability from left to right. It was then realized that a major factor in the system shifting from left to right was the angle of the sheave with respect to the wheel. If the sheave was not perfectly parallel with the wheel, it would push itself out of alignment. And since the angle of the sheave is adjustable through the changing of the position of the pipe clamp that secures the channel to the seat post, the sheave can be made parallel to the wheel. And, when the sheave is parallel to the wheel, the system is not unstable left to right. Once EEEAHBMS was successfully mounted onto the bicycle, it was time to collect some test data. While the bicycle was on the stand, the energy in and out of the battery was recorded after 60 seconds of the bicycle’s function at different speeds and different exertions of the rider. This data is hard evidence that the regenerative function of the system works. When the motor has to function by itself, energy is consistently leaving the battery. When the rider is aiding the motor with a moderate paced peddling, the motor does not have to use as much energy to maintain speed. And when the rider is sprinting, the motor is acting like a generator, sending the extra energy that the rider is providing back into the batteries. The exception to this is the sprinting test run at 24mph. The rider was not capable of accelerating the bicycle to 24mph, and therefore was only assisting the motor in maintaining the speed. While no energy was sent back to the batteries, the data is consistent. Peddling against the motor is exhausting for the rider. It takes a lot of energy to have the motor act like a generator and send energy back into the batteries. All of those 60 second test runs had the rider gasping for breath at the end, and the rider is an athlete. From this we can conclude that the majority of the regenerative braking will not stem from the rider. It takes too much effort for the rider to provide energy into the battery while maintaining speed. For this reason, most of the regenerative braking will result from the rider wanting to slow down when traveling downhill. In slowing down, the motor will take that energy and place it back into the batteries the same as it would if the rider was peddling faster than the desired speed. Analyzing the data more closely, it is evident that the data is consistent with the kinetic energy formula KE = ½mv2. In other words, energy of motion, is proportionate to speed squared. If we look at the data from Figure 8f, the data in the row of desired speed of 24mph is approximately 4 times that of the desired speed of 12mph. According to the kinetic energy formula, every double in speed should result in a quadruple of energy, and it did. After a successful testing session on the bicycle stand, it was time to test EEEAHBMS on the road, this time with a helmet. The path chosen was a 10% grade hill approximately .15 miles long. Therefore, the distance traveled in a round trip would be .3 miles, with half uphill and half downhill. The first test run was done without any peddling. The bicycle was set with a desired speed of 12mph and the round trip was made. The energy out of the battery was 7.8 Watt-hours and the energy into the battery was 0.1 Watt-hours (the result of stopping the bicycle at the end of the run). The same trip was repeated, this time with a comfortable peddling pace. The energy out of the battery was 4.4 Watt-hours and the energy into the battery was .2 Watt-hours (again, the result of stopping). To analyze these numbers, a few calculations need to be done first. The two batteries have a total voltage of 26 V when fully charged and are rated at 12 amp-hours. Since Power = Volts X Amps, and power is measured in Watts, Watt-hours = Volts X Amp-hours. Therefore, the two batteries store a total of 312 Watt-hours. However, not every Watt-hour will be used for EEEAHBMS efficiently. Only about 2/3 of the battery will be discharged each time, leaving 200 Watt-hours at the disposal of EEEAHBMS. And, accounting for efficiency loss, that number is probably around 170 Watt-hours. In the first run, a net of 8.7 Watt-hours were exhausted. Therefore, this .3 mile trip can be traveled 170 / 7.7 = 22.08 times before the batteries would be exhausted. Accordingly, the bicycle, without any assistance from the rider can travel 6.623 miles of hilly terrain at 12 mph before needing to be recharged. In the second run, a net of 4.2 Watt-hours were exhausted. Therefore, this .3 mile trip can be traveled 170 / 4.2 = 40.48 times before the batteries would be exhausted. Accordingly, the bicycle, with assistance that will not exhaust the rider, can travel 12.12 miles of hilly terrain at 12mph before needing to be recharged. · The bicycle does function as a motorized bicycle. · The bicycle is safe to ride on the road. While there are improvements to be made, EEEAHBMS can be declared functional. EEEAHBMS would have been impossible without the donation of time and materials from numerous sources. This section recognizes all the people who helped during the EEEAHBMS development process. Jeffrey Denenberg served as an invaluable resource during the entire project. As an electrical engineer, he helped to provide much of the background information necessary to begin the research for EEEAHBMS. Experienced in design and implementation, he served as an evaluator of designs and helped to point out many fatal flaws throughout the design process. Experienced with the safety required in the use of dangerous power tools, Jeffrey Denenberg served as a supervisor during the construction process. And, as an electrical engineer, Jeffrey Denenberg helped to evaluate the electronics of EEEAHBMS before they were implemented. Steven Buroff served as the software advisor of EEEAHBMS. He shared his experience as a professional programmer, and taught the design and implementation process that a successful programmer uses. Steven Buroff helped to provide a comfort level with IC by giving some programming instruction. And, finally, he served as a resource to draw on when any programming questions needed to be answered. Casey O’Donnell and Motors and Drives was another invaluable resource. As described in the materials section of this report, Casey O’Donnell helped to locate the correct motor and sheave for EEEAHBMS and his company, Motors and Drives, donated these components. Without this assistance, the budget for EEEAHBMS would not have been sufficient. After becoming aware of EEEAHBMS through a presentation given on behalf of the Trumbull High Science Department to the Trumbull Business Education Initiative, BEI was incredibly helpful. Their CEO, John Annick provided his telephone number in case any financial or construction assistance was needed. When the request was made for a welder, he supplied contact information for Art Bradshaw of Aquarion in Shelton, CT. Art Bradshaw reviewed the drawings, allowed the use of his digital camera for a few pictures and requested the services of Robert Cleri who welded the saddlebag. Robert Cleri is the machinist that works in the Aquarion substation in Stamford. This assistance was absolutely necessary, and it was given generously and in a timely fashion. Larry Farrell, a THS technology teacher, provided assistance when the Trumbull High metal shop was needed to trim the metal channel. He interrupted his Basic Electronics course and used the school’s bandsaw to trim the channel. The Bass family and the Gottlieb family generously donated the use of their digital cameras for EEEAHBMS. The Bass family digital camera is a Sony Cybershot DSCP2 and the Gottlieb family digital camera is an Olympus DM550. Without the frequent use of these cameras, accurate documentation of EEEAHBMS would have been impossible. Danielle Lenois’ donated of the use of her CycleOps bike stand, which enabled the safe testing of EEEAHBMS. Without her CycleOps stand, the instrumentation and data collection of EEEAHBMS would have been more difficult. EEEAHBMS was an ambitious project. As such, logical decisions had to be made as to what could be feasibly done within the time constraints and what could not. Unlike most projects, however, the submission of this report does not signal the end of EEEAHBMS. There are still many improvements that can be made, and work on EEEAHBMS will continue until the implementation is completed. The Software Requirements Document details every possible function of the EEEAHBMS program. However, because of time constraints, only the most vital pieces of the program were implemented. One of the largest next steps of EEEAHBMS is to complete the software according to the requirements document (see Appendix C Software Requirements Document). As was discovered during the first test run, the entire structure of EEEAHBMS has the tendency to shift from left to right, de-centering the sheave on the wheel. While this does not affect the functionality of the bicycle, an uncentered sheave does affect the efficiency of the contact between the sheave and the wheel and does increase the probability of slipping. The first solution devised to solve this problem was to brace the channel to the frame of the bicycle. However, since every bicycle frame is different, this would make EEEAHBMS bicycle specific, which is counter to its goals. So, another, more adaptable solution was devised. The other solution is to have free-wheeling wheels mounted to the saddlebag, perpendicular to the motor sheave, rolling on the side of the wheel. This would prevent the system from moving left to right and maintain its adaptability, while only adding minimally to the total friction and energy loss. It does require welding and significant mechanical work, and for this reason it was added to Next Steps. The mounting of the batteries to the saddlebag can be greatly improved with an adjustable sliding tray (see section 5.3 Motor and Batteries). This would allow the batteries to better counter-balance the motor. In the testing and debugging process, the current sensor’s initial resistor was changed from a 1 milliohm resistor to a 10 milliohm resistor in order to improve performance. While this was successful in improving the functionality of the current sensor, that 10 milliohm resistor is a drag on efficiency. At the optimum functioning current of 10 amps, that is a loss of .1V. Therefore, another next step is to look for a better solution to the current sensor problem, taking out that 10 milliohm resistor and replacing it with a smaller one. After EEEAHBMS was tested on the road, the observation was made that the current sensor wire insulation had melted into the battery. This is a terrible safety hazard. If the wire had melted through the top of the battery as well, the sealed lead acid batteries would no longer be sealed. Therefore, while the current sensor functioned effectively on the test run, it needs to be replaced with a heavier gauge wire in order to not endanger the battery. The current gauge of 22 cannot handle the 20 amp currents that the bicycle pulls when going uphill at 12 miles per hour. While EEEAHBMS was tested and proven functional, there is still much testing left to do. EEEAHBMS needs to be tested over longer distances and different terrains to assess its true functionality as a long distance travel bicycle. During the initial design process, the belt friction drive was the most desirable drive system design (see section 3.1.1 System Design). However, the friction drive system was chosen as the initial drive system design for simplicity. Now that EEEAHBMS is working, steps can be taken to adapt to the more desirable drive system. And, with this added originality in design, steps can also be taken to patent EEEAHBMS. EEEAHBMS is extremely heavy, approximately 67 lbs. One large improvement of EEEAHBMS would be to find a way to lighten the entire structure without sacrificing functionality. Lightening would enhance the system efficiency by making the bicycle easier to accelerate. A simple way to lighten the entire structure is to find a lighter material for the industrial metal channel. However, the channel does serve as the spine for EEEAHBMS and supports a lot of weight. Therefore, care must be taken not to sacrifice too much strength for weight. The goal of the hybrid bike project is to build a motorized bicycle that uses regenerative braking to recharge its batteries when the rider is pedaling faster than is necessary to achieve a specified speed. The software must control or monitor the following hardware. The bike will be powered by a Leeson 1800 Motor, 24V, ½ horsepower (pulls about 20 amps at rated load), 1800 rpm motor. The motor controller controls the average voltage applied to the motor. A control voltage is applied to the controller and this controls the actual voltage applied to the motor. The control voltage is not the same as the motor voltage. The control voltage is a D.C. voltage. The controller applies an A.C. square wave voltage to the motor. Varying the control voltage varies the duty cycle of the square wave, which varies the average D.C. value of the motor voltage. The software cannot change the motor voltage (or current) directly. The software can only vary the control voltage. Note: The h-bridge controller will automatically shut down when the battery voltage drops below 18 volts. This is to protect the lead acid batteries from full discharge. The software recognizes that the controller has shut down by noticing that the current is zero (see section 9.8.4). This condition is communicated to the user via the display (see section 6.5.4). The motor will be powered by two 12v, 12amp-hr batteries connected in series to provide a nominal 24V (actually 26 volts at full charge, reduced under heavy current conditions). The HandyBoard (HB) is a programmable robot controller that can monitor various types of sensors and control motors and servos. The HB also includes an LCD display with 2 rows of 16 characters each (but see section 6). The HB is programmed in Interactive C (IC). The HB and IC provide a “persistent variable” feature. A value stored in a persistent variable will retain its value when the HB is reset, power cycled, or when main() exits and is subsequently reinvoked. A persistent variable will be reset to the value of its initializer when the program is downloaded into the HB. A SPDTCO (Single-Pole, Double-Throw, Center-Off) momentary contact switch used to control the bike’s target speed. To the software, this switch appears as two buttons on two separate digital sensor ports. See section 4.1.2 for details. A simple two-position switch used to set the bike’s performance mode (see section 4.1.6). It is connected to a digital sensor port. A button connected to a digital sensor port. When clicked, it causes the display to be advanced to its next view. This is done no matter which mode (frozen or cycling) the display is in. Clicking this button does not change the display’s mode. See section 6. A button used to reset all persistent variables to their default values (see section 4.1.8). It is connected to a digital sensor port. A button connected to a digital sensor port and mounted near the bike’s right brake handle. Clicking the button will cause the system to perform an emergency shutdown (see section 4.1.9). An analog sensor that measures the battery voltage (see section 4.1.3). An analog sensor that measures the motor’s average voltage (see section 4.1.4). An analog sensor that measures the motor’s current (see section 4.1.5). An encoder that measures a value proportional to the number of rotations of the motor. See section 4.2.1 for details. The encoder increments a counter as it rotates. The count can be read with an IC library function. In order for this to work, the encoder must be connected to one of the digital ports 7, 8, 12, or 13. It should be attached to port 7 or 8 if at all possible since using one of the other ports will cause significant performance degradation. A servo that is used to shut down the bike in an emergency. 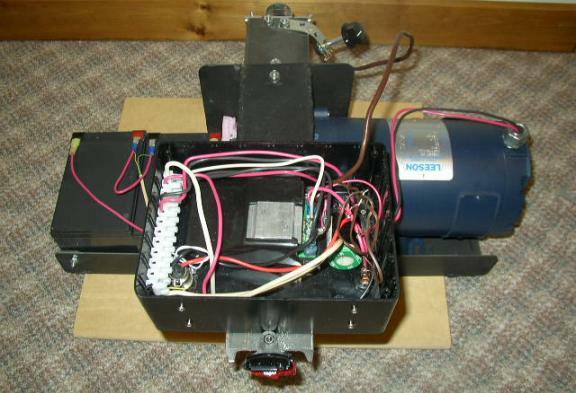 The servo is connected to the motor controller’s emergency shutdown pin. Rotating the servo will pull the pin and shut down the motor. See section 11.12 for details. The software will be programmed in IC using the HB library. The software will be divided into three major subsystems, monitor, control, and view. The monitor subsystem monitors two types of values, direct and computed. Direct values are obtained directly from the hardware. Computed values are computed from the direct values. 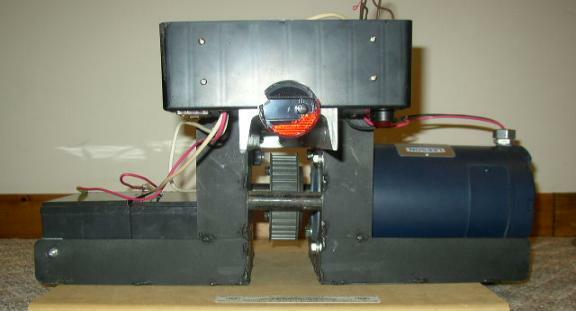 An HB encoder measuring the motor speed. The value read from the encoder is the number of ticks since the last time the encoder was reset. The encoder value must be converted to the actual speed (see section 4.2.1). The target speed is controlled by 2 HB digital sensors (see section 2.5.1), one to increase the target speed and one to decrease it. The magnitude of the increase or decrease per button click is a configuration parameter (see section 10.2.3). An HB analog sensor with a value in the range 0 – 255. The value read is a linear function of the battery voltage (see section 4.2.3). An HB analog sensor with a value in the range 0 – 255. The value read is a linear function of the actual average motor voltage; i.e., the D.C. voltage being applied to the motor (see section 4.2.4). This is not the same as the motor control voltage or the battery voltage. This is the value being applied to the motor by the motor controller. An HB analog sensor. The value read is an integer in the range 0 – 255 that is a linear function of the actual motor current (which is the same as the battery current) (see section 4.2.5). The current pulled by the motor controller is negligible as is the current pulled in maintaining the HB battery. An HB digital sensor connected to a switch. When the switch is “on” (digital() returns true), then the board is in “high-performance” mode. When the switch is “off”, the board is in “normal” mode. Note that this is a switch, not a button. An HB digital sensor connected to a button. When the button is clicked, the display is advanced to the next view (see section 6). An HB digital sensor connected to a button. When the button is clicked, all persistent variables are reset to their initial values. A HB digital sensor connected to a button (see section 2.5.6). When the button is clicked, the system performs the hardware shutdown function (see section 11.12), which, in turn, will cause a software shutdown (see section 11.13). The actual speed of the bike in mph., a linear function of the motor rotation speed encoder (see section 2.7.1). A floating-point value. The speed is calculated from the encoder reading using the following configuration parameters. Next, the speed in mph is computed as follows and stored in the global variable. All computations in both formulas are carried out in floating-point. The speed the user has requested in mph. A floating-point value. The target speed is initialized to zero when the system is started. It is then controlled by the target speed switch (see sections 2.5.1 and 4.1.2). The actual voltage of the battery (in volts), a floating-point value that is always positive. It is a linear function of the battery voltage sensor (see section 4.1.3). The actual battery voltage is obtained by multiplying the sensor reading by a configuration parameter (see section 10.2.4). See sections 10.2.5 and 10.2.6 for descriptions of the configuration parameters. See sections 10.2.7 and 10.2.8 for descriptions of the configuration parameters. We keep track of the total energy consumed by the system from the battery and supplied by the system to the battery as two separate floating-point values. 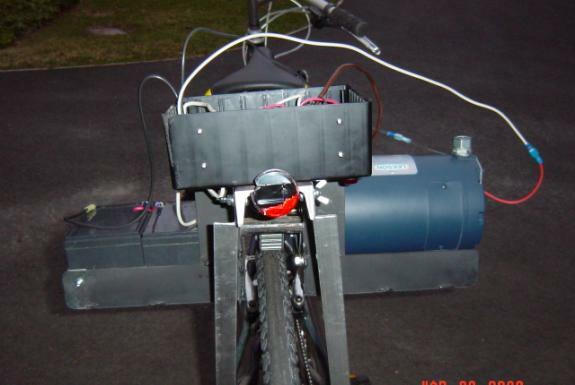 When the bike is moving faster than requested, the motor acts as a generator and supplies power to the battery. When the bike is moving more slowly than the requested speed, the battery supplies power to the motor. The units of the energy accumulators are watt-hours. (The battery, at maximum charge, has about 300 watt hours. However, at high discharge rates not all of this energy is available.) The two accumulators (in persistent memory) are initialized to zero. A logical thread runs periodically to sample the instantaneous power and increment one of the accumulators. The period of the thread is in milliseconds (see section 10.2.9). Which accumulator is updated is determined by whether the current is positive or negative. If it is positive, then the motor is consuming energy. If it is negative, then the motor is supplying energy. The instantaneous power is the motor voltage times the motor current.. We are assuming that all power is transferred between the battery and the motor; i.e., the power loss in the controller and any other parts of the system is negligible. Each time the energy thread runs, it determines which accumulator to update (by checking the sign of the motor current) and then updates it using the following formula. The control subsystem controls the following values. The motor speed is controlled by the HB motor() function. The speed is specified as an integer value in the range (-100, 100). A positive speed causes the motor to consume power from the batteries while a negative value causes the motor to act as a generator and supply energy to the batteries. The motor speed is controlled by a thread (see section 9.7) that runs periodically (see section 10.2.13). The thread determines the correct value for the motor speed and uses the HB motor() function to set that value. The value to set is dependent on the following values. The setting of the “performance mode” switch (see section 2.5.2). Whether we need to accelerate or decelerate. Whether the motor current is excessive, i.e., above the overload threshold (see section 10.2.14. If the target speed is greater than the current speed, we need to accelerate. If the target speed is less than the current speed, we need to decelerate. When we are in normal state (i.e., not in overload), the value of the next argument for the motor() function is obtained from one of four arrays of integer values in the range (-100, 100). All four arrays are of the same size. There are two pairs of arrays, one for accelerating and one for decelerating. Each pair of arrays consists of one used for normal performance and one for high performance. Therefore, the combination of accelerate vs. decelerate and the performance mode determines which array to use. Once the correct array has been determined, the index is calculated as follows. The value obtained from the table determines the value to apply to the motor if the system is in safe mode. If we are in overload, then the value computed above must be modified. After applying the above algorithm to get the “safe mode” value, we use the following algorithm to determine if we are in “overload” mode and, if so, modify the “safe mode” value. The algorithm uses the following values. <current> The motor current (see section 4.2.5). <new motor value> The new value to set the motor to. Initialized to the “safe mode” value computed above. <adjustment> A field initialized to zero in the class’s constructor. <overload current threshold> A configuration parameter (see section 10.2.14). <overload adjustment incr> A configuration parameter (see section 10.2.15). <overload current critical difference> A configuration parameter (see section 10.2.16). The algorithm is given in Figure 1. If the controller is putting out a voltage of zero, the bike is coasting. (slowly decelerating on level ground due to friction losses.) This means that the nominal will never quite be the target speed. If we are going uphill or against the wind, the actual speed will be a little less than the target speed. If going downhill, the actual speed will be a little greater than the target speed. The magnitude of these differences depends on the table entries. The HB has an LCD display consisting of two rows of 16 characters each. The last character of the second row is used by the system as a “heartbeat” (it flashes if the system is OK) and is thus not available for use by the software. There are thus a total of 31 characters available for output. This is clearly not enough to display all the data we wish to provide the user. Therefore, we display the data in multiple “views”. The display subsystem operates in one of two modes, “frozen” or “cycling”. In “frozen” mode, a single view is displayed continuously. It is updated at the cycling rate (see section 10.2.18) so that its data is kept current. In “cycling” mode, the subsystem will cycle through the views displaying each for a configured period of time (see section 10.2.18) and then going on to the next. When the system is running, the display mode (frozen or cycling) is controlled by the “display mode switch” (see section 2.5.3). When the system is shut down (see sections 11.13 and 7.6), the display is always in “frozen” mode and this switch is ignored. The “advance display” button (see section 2.5.4) will advance the display to the next view irrespective of its current mode (frozen or cycling). It will not affect the mode. When a fatal condition (such as “dead battery”) occurs, the status view (see section 6.5) is displayed and the display subsystem is frozen so that the error message is constantly displayed. This view displays the actual speed (see section 4.2.1) and the target speed (see section 4.2.2) as follows. This view displays the energy into and out of the battery (see section 4.2.6) as follows. The “W-H” stands for “Watt – Hours”. The asterisk will always appear in on row but never both. If current is positive (flowing from the battery to the motor), then the battery is discharging and the asterisk will be in the “Out” row. If the current is negative (flowing from the motor to the battery), then the battery is being charged and the asterisk will be in the “In” row. This view displays the odometer (see section 8.4) and the battery voltage (see section 8.1) as follows. If the battery voltage is low, the “OK” is replaced with “LOW”. If the current is high (in overload), the “OK” is replaced with “HIGH”. This view is different depending on the system status. The following view is displayed when the system is running. When this status is displayed, the view is cycled with the other views. When the system is in “high-performance” mode (see section 4.1.6), the “NORMAL” is replaced with “HIGH”. The following view is displayed when the system is in a startup delay waiting for the bike to attain the required speed (see section 11.7). When this status is displayed, the display is frozen. The following view is displayed when a dead battery condition is detected (see section 9.8.2). When this status is displayed, the display is frozen to the status view; the other views are not displayed. The following view is displayed when a shutdown condition is detected (see section 9.8.4). When this status is displayed, the display is frozen to the status view; the other views are not displayed. The following values are kept in non-persistent global variables. The actual speed of the bike in mph., a floating-point value. See section 4.2.1. This value is maintained by the speed thread (see section 9.6). The bike speed the user has requested, in mph., a floating-point value. This value is maintained by the target speed monitor (see section 4.2.2). A flag set when the battery voltage is low. This value is maintained by the problem monitor (see section 9.8.1). A flag set when the dead battery condition is detected. This value is maintained by the problem monitor (see section 9.8.2). A flag set when the system is in an overload condition. This value is maintained by the motor controller (see section 5.1). A flag set when a software shutdown is performed. This flag is set by the shutdown method (see section 11.13). It is cleared during system initialization. The following values are kept in persistent variables. The total energy supplied to the battery by the system in watt-hours, a floating-point value (see section 4.2.6). This value is maintained by the battery energy thread (see section 9.2). The total energy supplied to the system by the battery in watt-hours, a floating-point value (see section 4.2.6). ). This value is maintained by the battery energy thread (see section 9.2). The total distance traveled, in miles, a floating-point value (see section 4.2.7). This value is maintained by the odometer thread (see section 9.3). The following logical threads of control are required. They do not necessarily have to be implemented as separate threads or processes. Some of them can be called from a Timer object’s thread. This thread maintains the value of the “battery voltage” persistent variable (see section 8.1). It gets the voltage from the battery monitor (see section 4.2.3). The thread that maintains the battery energy accumulators (see sections 4.2.6, 8.2, 8.3, and 10.2.9). The thread that maintains the value of the odometer global variable (see sections 8.4, 4.2.7, and 10.2.10). A thread that cycles the display through its views (see sections 6 and 10.2.18). The HB digital sensor returns a state. In order to detect a button click, the button must be sampled periodically (see section 10.2.11) to detect the button being clicked and then released. This thread must be run fast enough to detect a button click. This single thread handles all of the system’s buttons. The thread that controls the motor speed. See sections 5.1 and 10.2.13). The purpose of this thread is to monitor the system for various problem conditions. Its period is given by a configuration parameter (see section 10.2.19). The conditions checked for are described in the following sections. If the battery voltage drops below a threshold (see section 10.2.21), the “low battery voltage” condition is set (see section 7.3). The only action taken when this condition is set is to display it (see section 6.4). If the low batter condition is set and the voltage is above the threshold, then the condition is cleared. If the battery voltage is below a configured value (see section 10.2.22), then a global variable (see section 7.4) is set. When this condition is detected, the system performs a hardware shutdown (see section 11.12). This, in turn, will cause a software shutdown (see sections 9.8.4 and 11.13). If the current ever rises above a configured value (see section 10.2.23), we perform a hardware shutdown (see section 11.12). This, in turn, will cause a software shutdown (see sections 9.8.4 and 11.13). If the current ever drops below a configured value (see section 10.2.24), the hardware is assumed to have been shut down, either by the software (see section 11.12) or directly by the user or the hardware itself. In either case, we perform a software shutdown (see section 11.13). The following sections describe the software configuration parameters. The HB encoder port number from which to read the motor speed (see sections 4.1.1 and 4.2.1). The HB encoder port number is an integer in the range 0 – 3. It encoder ports correspond to the digital input ports 7, 8, 12, and 13. The HB digital sensor port number for the “increase target speed” button (see section 4.1.2). The HB digital sensor port number for the “decrease target speed” button (see section 4.1.2). The HB analog sensor port number for the battery voltage (see section 4.2.3). The HB analog sensor port number for the motor voltage (see section 4.2.4). The HB analog sensor port number for the motor current (see section 4.2.5). The HB digital sensor port number for the performance mode switch (see section 4.1.6). The HB digital sensor port number for the display mode switch (see section 6). The HB digital sensor port number for the “advance display” button (see sections 2.5.4 and 6). The HB digital sensor port number for the “reset persistent variables” button (see section 4.1.8). The HB digital sensor port number for the “shutdown application” button (see sections 2.5.6 and 11.12).